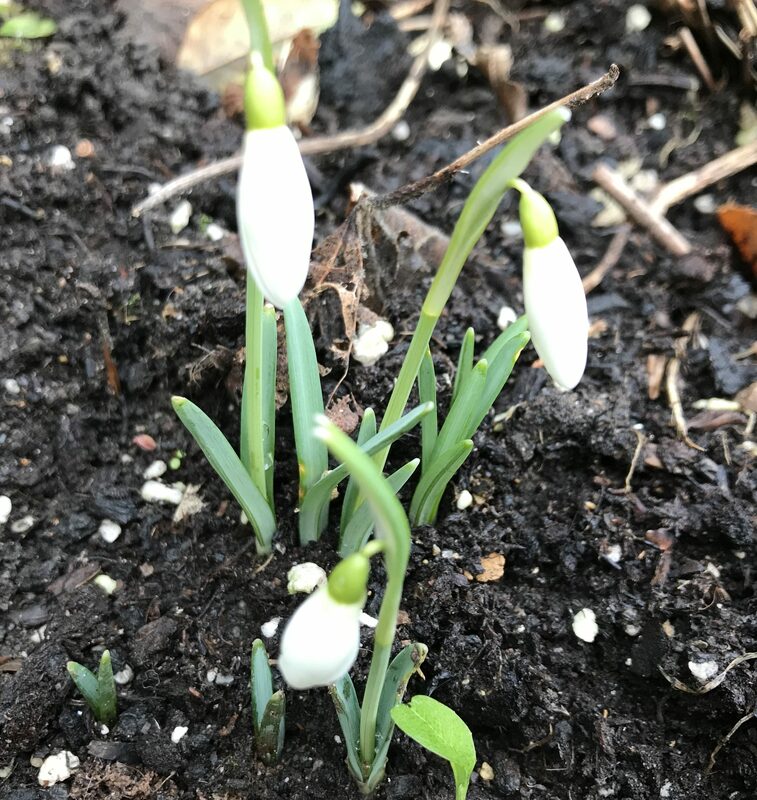 Snowdrops are peeping in the garden. I planted these in the green last spring so hopefully now they’ll start to spread and establish. 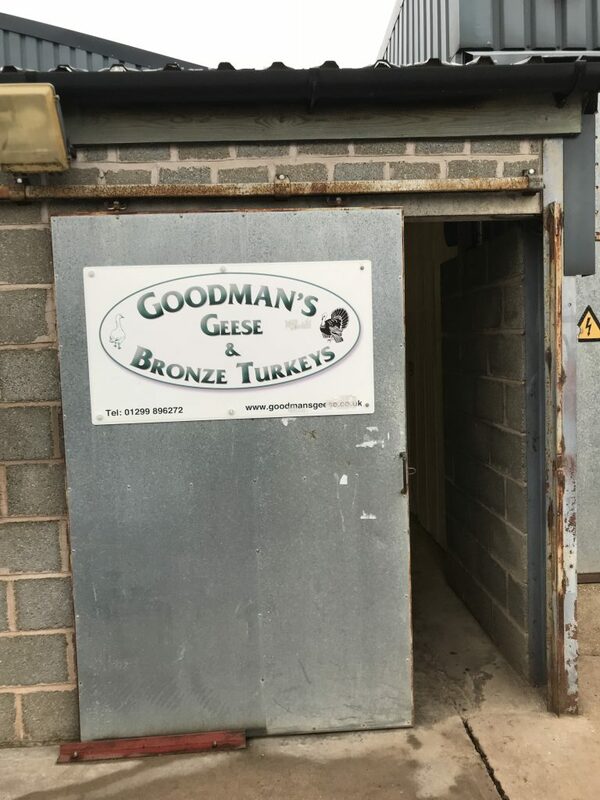 …and the other because Matt wanted to watch the Stourbridge Stagger 10k running race. 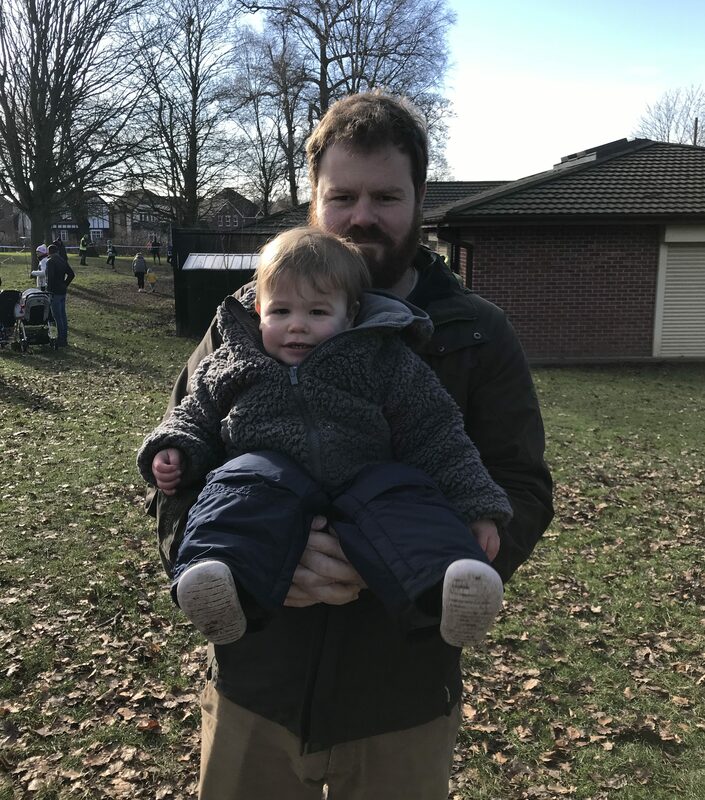 This picture gives no indication of how painfully cold it was in Stourbridge yesterday. 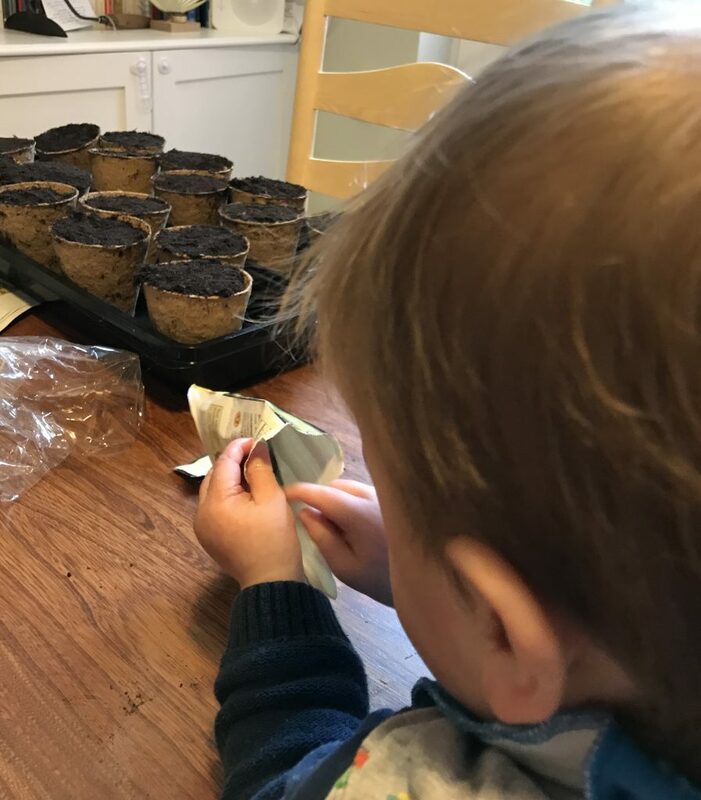 The rest of the time I’ve been finding indoor pursuits, including finally planting the broad beans that I meant to sow back in November, and lots and lots of cooking. 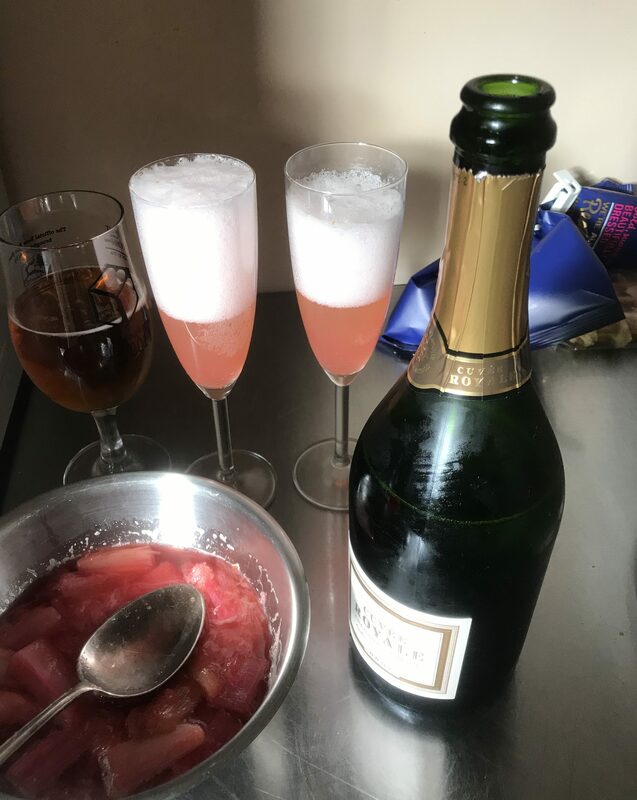 There’s been braised ox cheeks with ancho, a massive chocolate meringue cake, spicy lamb kebabs, tzatziki with flat breads and the first – glorious – rhubarb bellini of the year. Actually, the first for three years, as in 2018 the booze made me feel too poorly and in 2017 I was pregnant. I spent a fortune on the precious pink stems and, for once, I don’t regret a penny of it. First rhubarb bellini in three years! I know there are some who give up booze and carbs and dairy and joy for January, but I think you need to find whatever sustenance you can to get through these icy-cold days. This recipe for Norwegian baked pancakes is just the ticket. 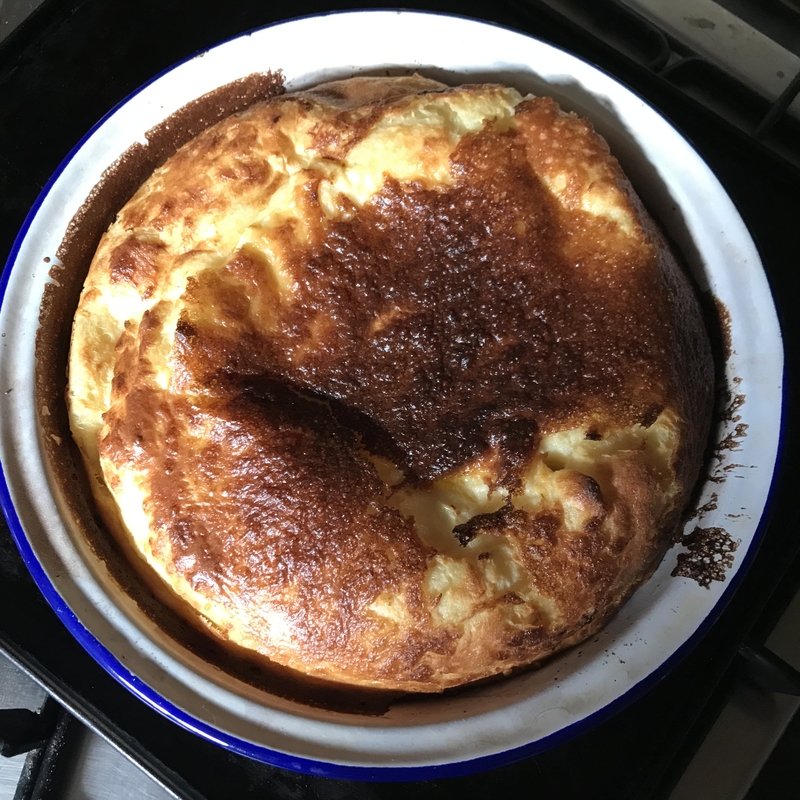 This baked pancake has a greater proportion of egg and milk to flour than our normal pancakes and so it cooks into something more like a custard than a pancake. I found the recipe in the Nordic Baking Book, which is a dense encyclopaedia of all things to do with Scandi baking. The author, Magnus Nilsson, is EXTREMELY particular about the way things are done (and quite rightly too as this is meant to be a documentary book). However at home we can have more leeway. If you prefer a more cakey pancake, just add a few more spoonfuls of flour. The original has no sugar in it – though you could add some if you like – making it an ideal accompaniment to morning bacon or maple syrup and berries. It will happily keep in the fridge for a few days after baking. Preheat the oven to 220c. 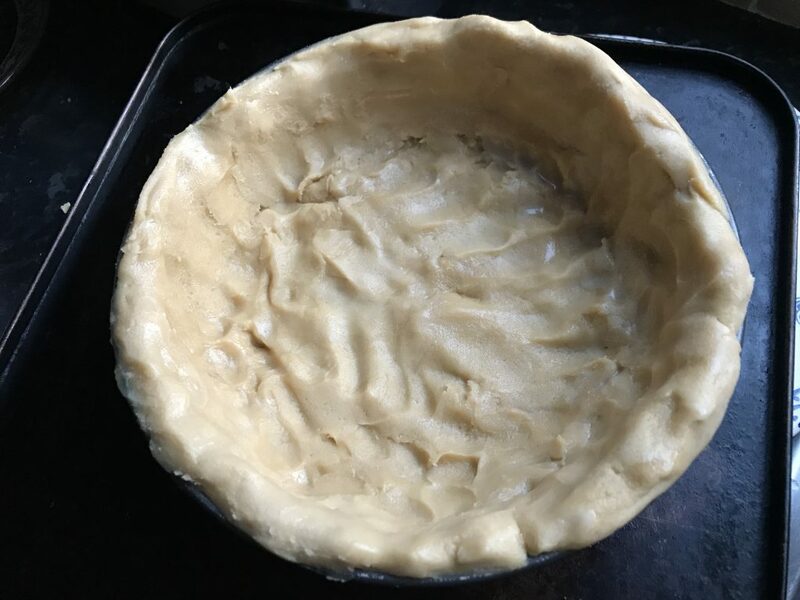 Place a baking dish large enough to hold your mixture into the oven to warm – I used a 8inch round pie dish. Add the butter to the dish and return to the oven to melt. 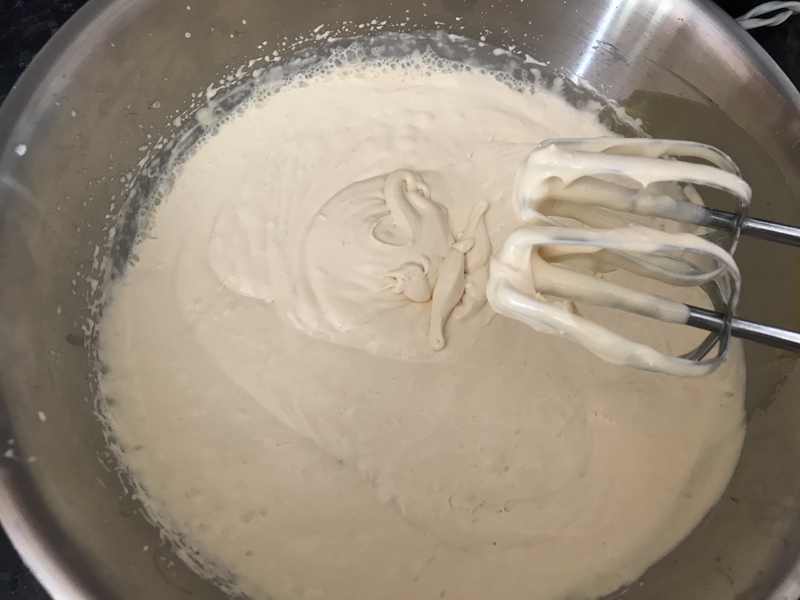 Combine the flour, eggs, salt and half the milk in a bowl and whisk until no lumps remain. Add the rest of the milk. (This bit is just the same as for making Yorkshire Puddings). Swirl the melted butter around your dish to coat. Add the batter and return to the oven to bake. Cook for 30 minutes until dark golden and completely set. Leave to stand for 5 minutes before serving. 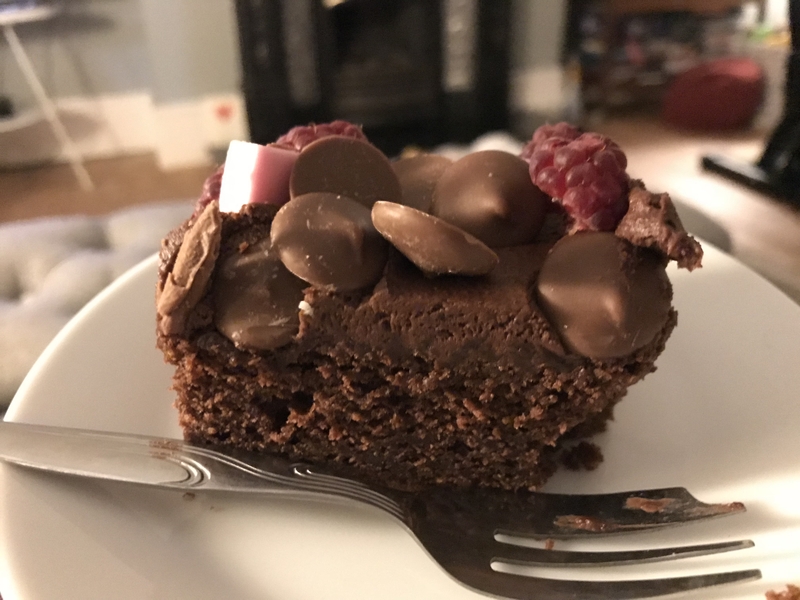 Cooking and eating: Beef cheeks braised with ancho and tomato, golden wholemeal soda bread, golden oat and raisin cookies, rabbit braised with root veg and pearl barley, chocolate dacquoise, chocolate meringue cake, rhubarb bellinis. 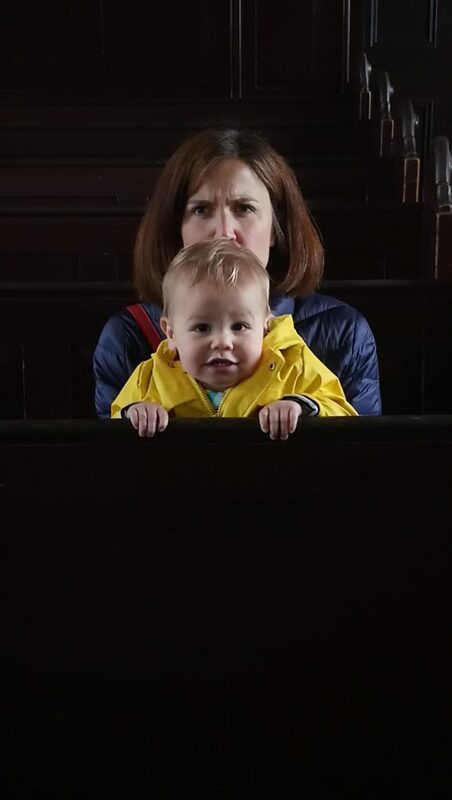 Harry’s first trip to Original Patty Men. Reading: Becoming by Michelle Obama – from the library rather than giving Amazon any more ££. Also: Just trying to keep warm. Matt comes from a family of home-bakers. I’ve written before about how Granny used to make hundreds and hundreds of mince pies at Christmas, selling them to friends and neighbours. 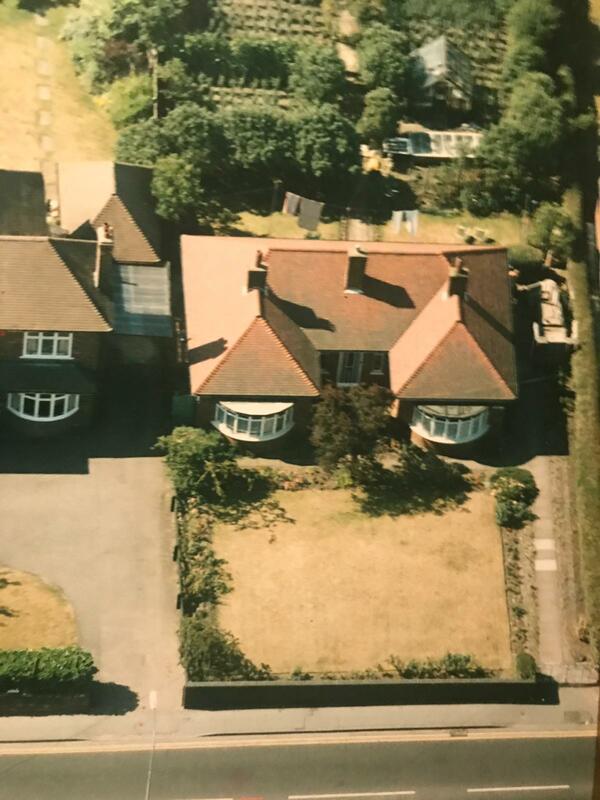 Her skills extended to apple pie too – the apple trees in their garden (presumably planted by Grampy) produced a massive crop and so Granny would turn the windfalls into foil-wrapped bakes that she supplied to her loyal following of customers. Matt’s family playing next to those amazing apple trees. Granny is wearing the blue cardigan. 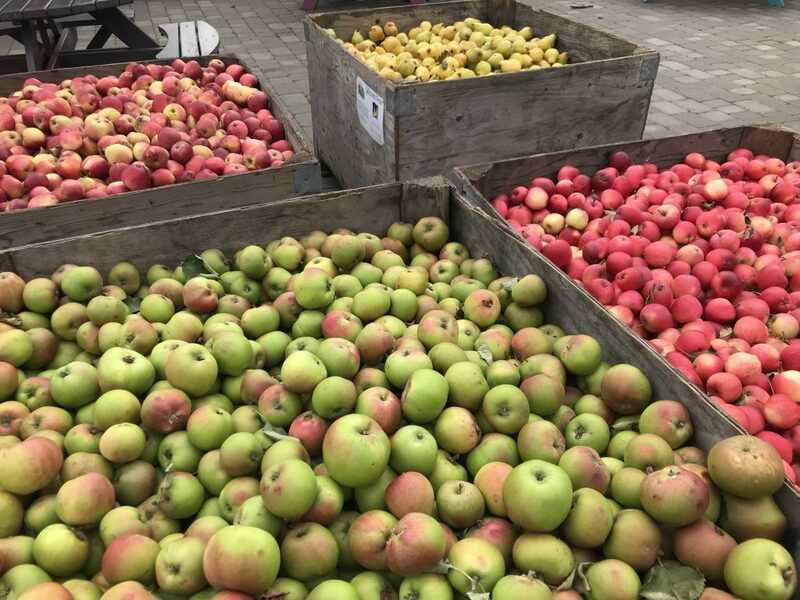 Granny passed away in 2017, and her house and the apple trees are now sold, but her apple legacy lives on. Matt’s Mum, Jean, carries on the tradition with her perfect, melt-in-the-mouth apple plate pie. 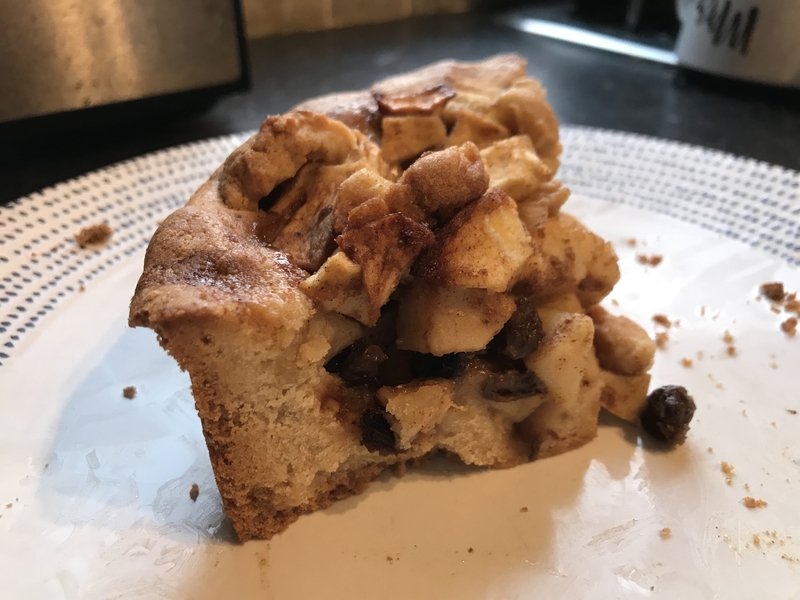 She made one at Christmas which Harry practically inhaled, it was so good, and I couldn’t help but compare this masterclass of good, old-fashioned pastry work with my rather clunky attempts. Plate pies are uncommon now, with restaurants and bakeries seeming to prefer the deep-dish American-style pie. If I make an apple pie it’s always deep, and the all-butter pastry that I make is tasty but prone to shrinking and can easily teeter over the edge to toughness. Jean’s pastry (and my Mum’s, come to that), remains crumbly and light. “What’s the secret?”, I asked. Jean replied: “The answer is lard. And margarine.” Marg! I can not remember the last time I had a block of margarine in my fridge. But then I recalled that at school, I was taught to make shortcrust with the combination of lard and margarine, NEVER butter. I had to think that the older generation of bakers may be onto something. 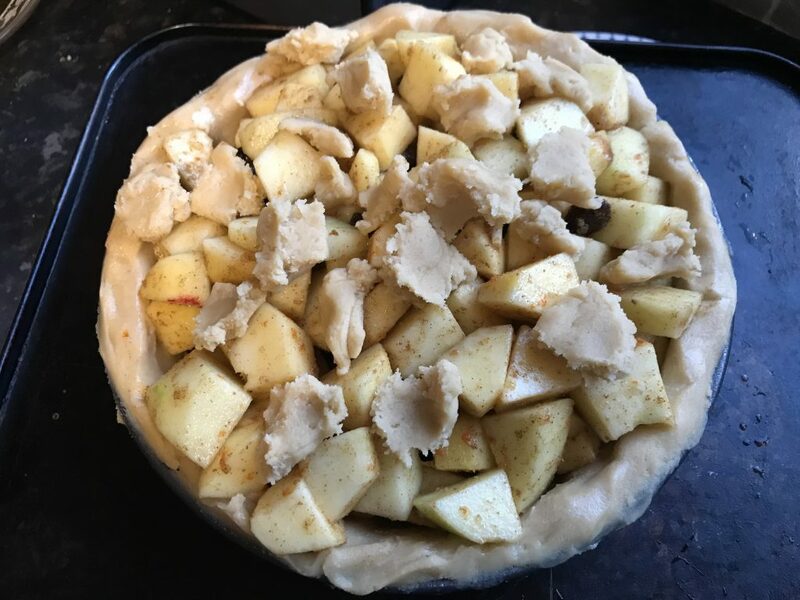 And so, in the spirit of honouring the wisdom of our fore-mothers, I decided to have a go at making the famous Apple Plate Pie. Jean explained that she used the ratio of half-fat to flour in her pastry, and that the fat is 50% lard and 50% Stork. So for one pie, she would use 12oz of flour, 3oz lard and 3oz Stork. In modern language that’s 300g flour, 75g lard and 75g Stork. Incidentally she also texted that I should use self-raising flour, which I instantly forgot, so I used plain. Simply whizz the flour with the cold fat in a food processor until thoroughly combined. 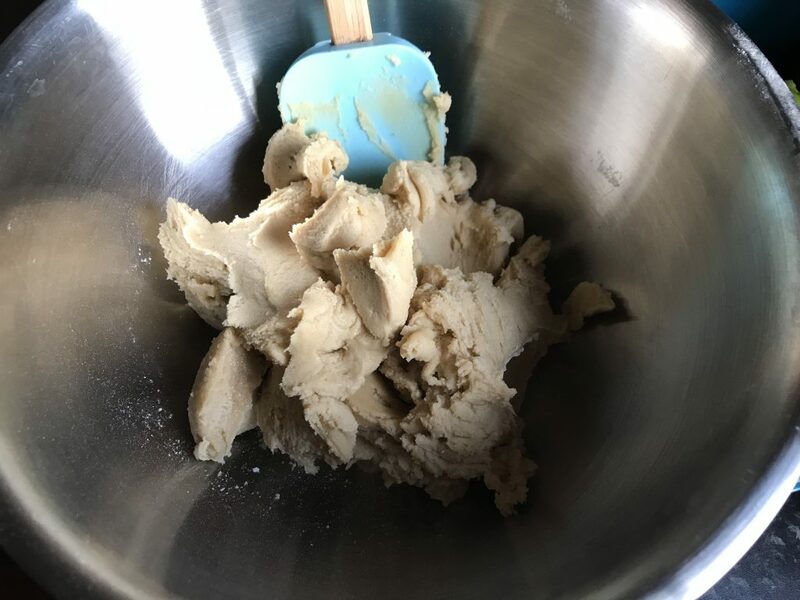 This step is important – I have always rubbed fat into flour using my fingers in some mis-guided attempt at authenticity, but it leads to uneven lumps of fat that make for flaky, rather than short, pastry. The food processor gives a far superior result. Jean never uses the food processor to mix the water, preferring to use the classic round-knife method. So turn the mixture out into a bowl, add a few tablespoons of cold water and cut in with a table knife. (If you’ve got one of those knives with the white, faux-ivory handle, so much the better.) 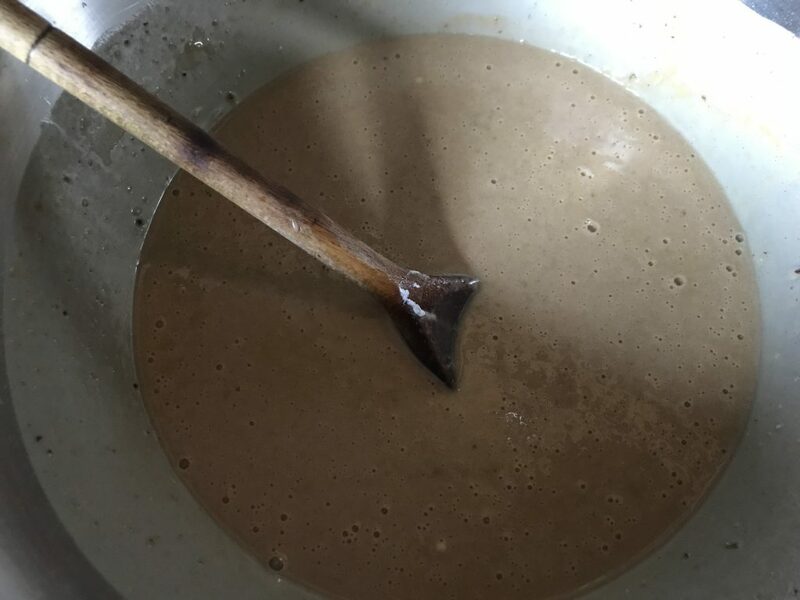 Once the mixture looks claggy then use your hands to bring it to a dough. It comes together in seconds. 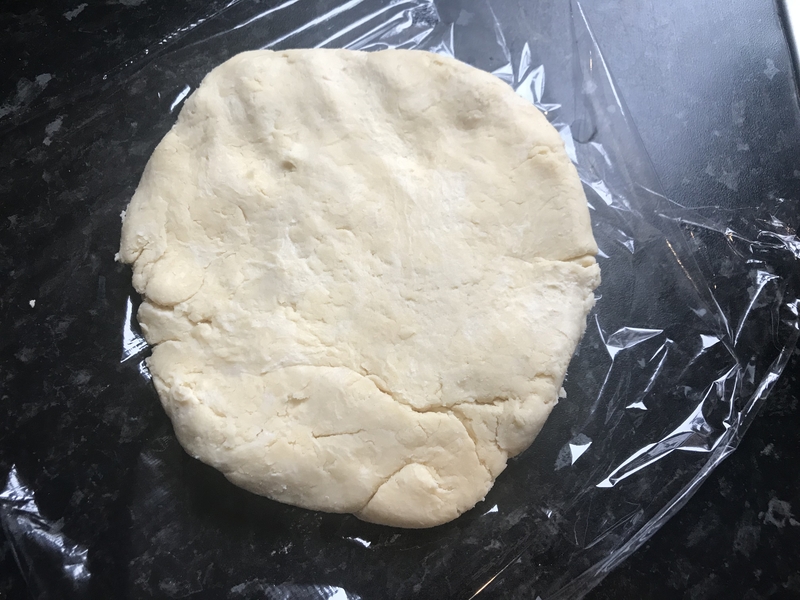 Give the pastry a very subtle knead to ensure everything is combined, then flatten out and put to one side. Jean usually uses her pastry straight away but I prefer to chill mine while I make the filling. On to the filling. 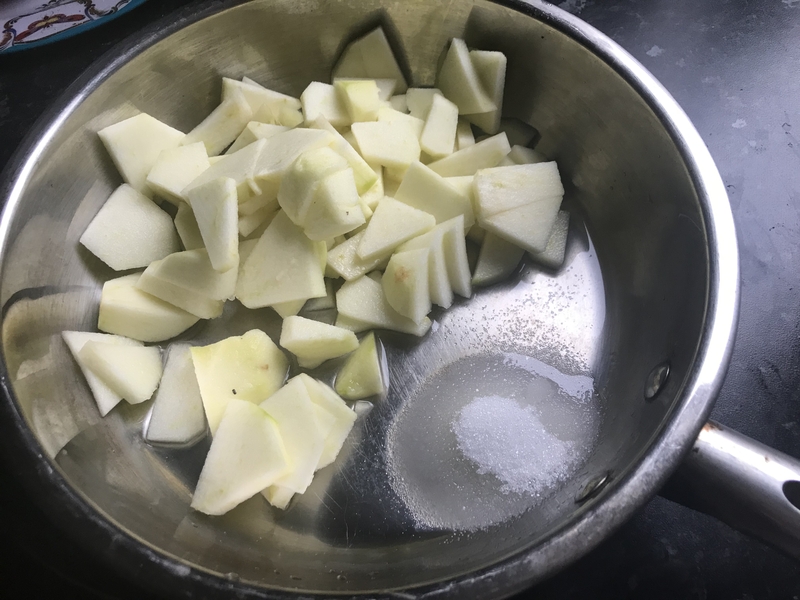 Bramley apples are the thing to use – although one of mine was rotten inside so I substituted a few Braeburns, which turned out just fine. 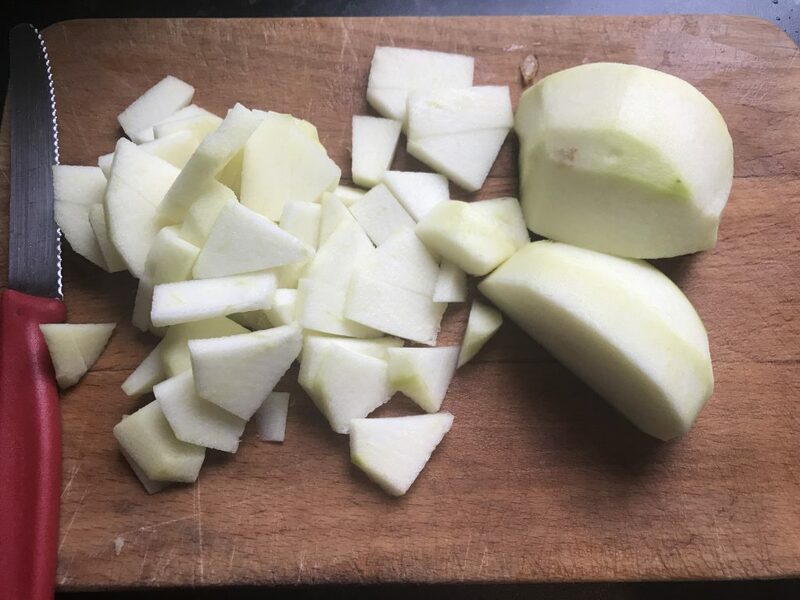 Peel, core and then slice the apples into chunky slices – if you want a smoother filling, like Granny used to, just slice the apples more finely. 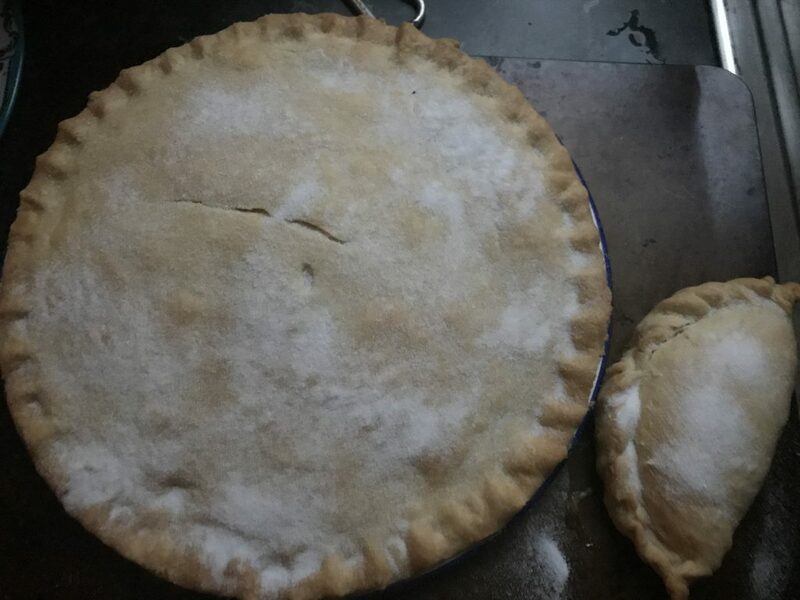 Two big bramleys should be sufficient for one pie, or 1 bramley and 2 smaller eating apples. 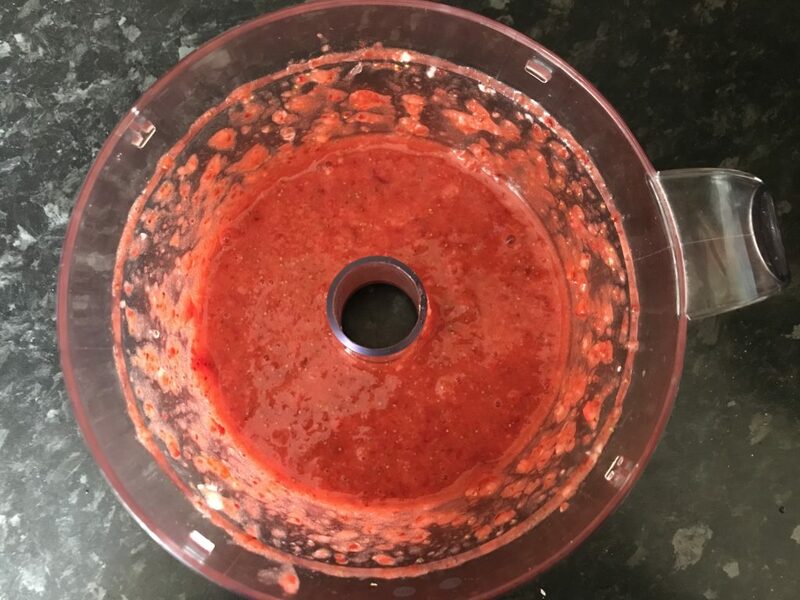 Pile the fruit into a pan with a tablespoon of sugar, a tablespoon or two of water, then cook over a low heat until pulpy. Give it a taste and if it needs more sugar, add it now. Remove the apples from the heat and chill for half an hour or so, until cool. 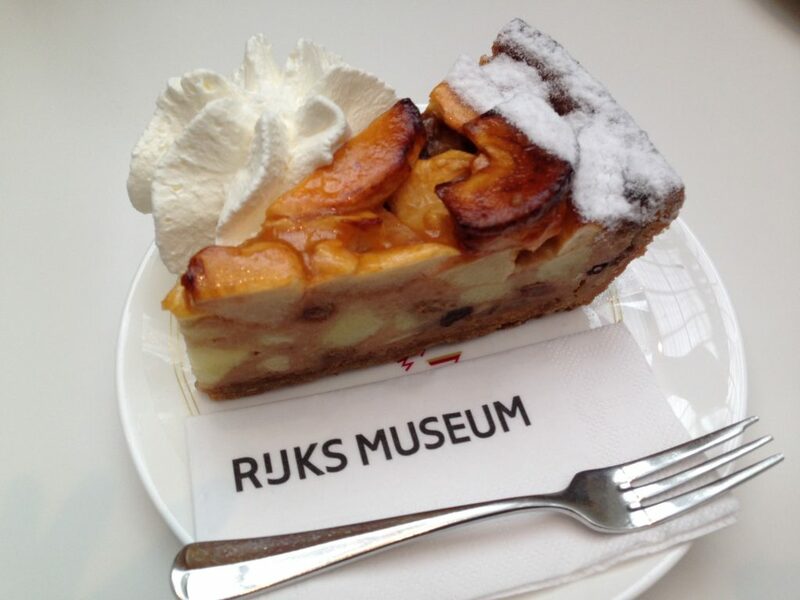 I’ve learnt from previous disasters to never put hot fruit on cold pastry so trust me on this one – apples in the fridge. 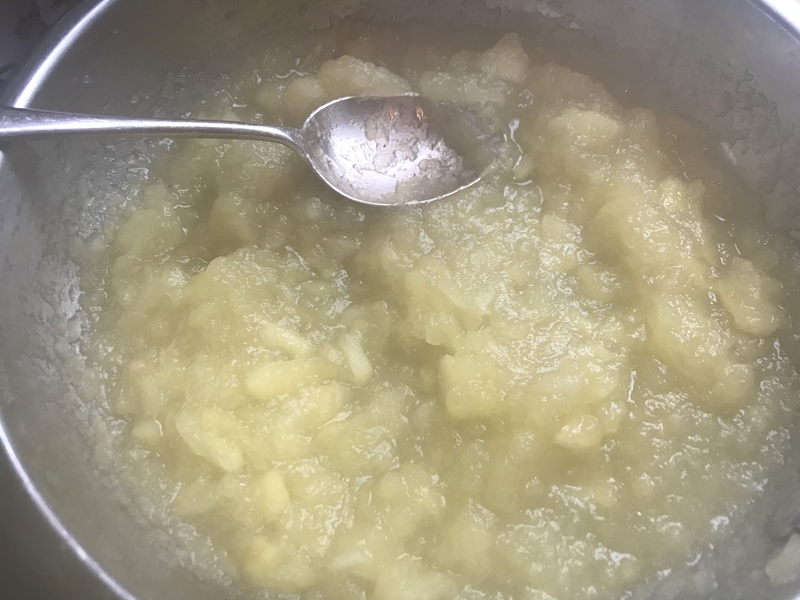 My apples cooked down into a dry-ish pulp but if they turn out very wet, use a slotted spoon to remove the bulk of the fruit from the water. 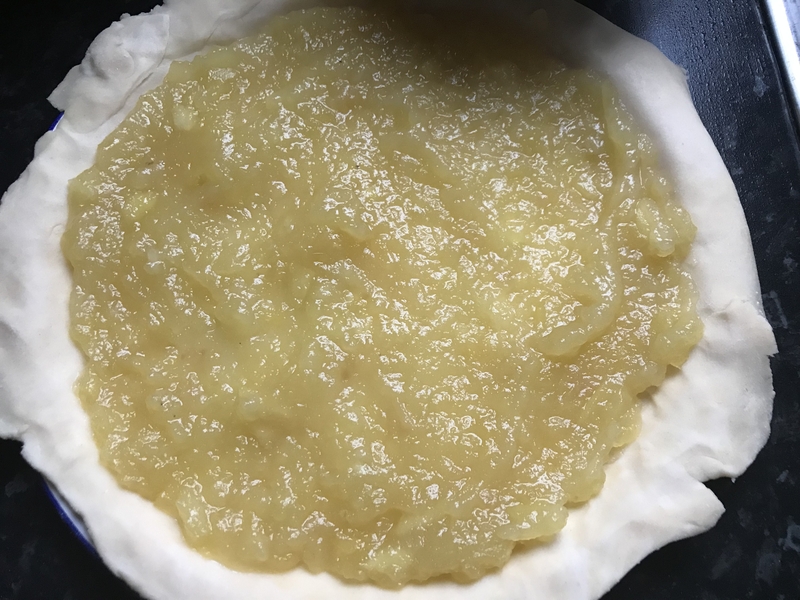 Now we make the pie. Pre-heat the oven to 180c and find yourself an ovenproof plate, about 20cm/8inches in diameter. I use a pleasingly retro white enamel one. There’s no need to grease the plate. 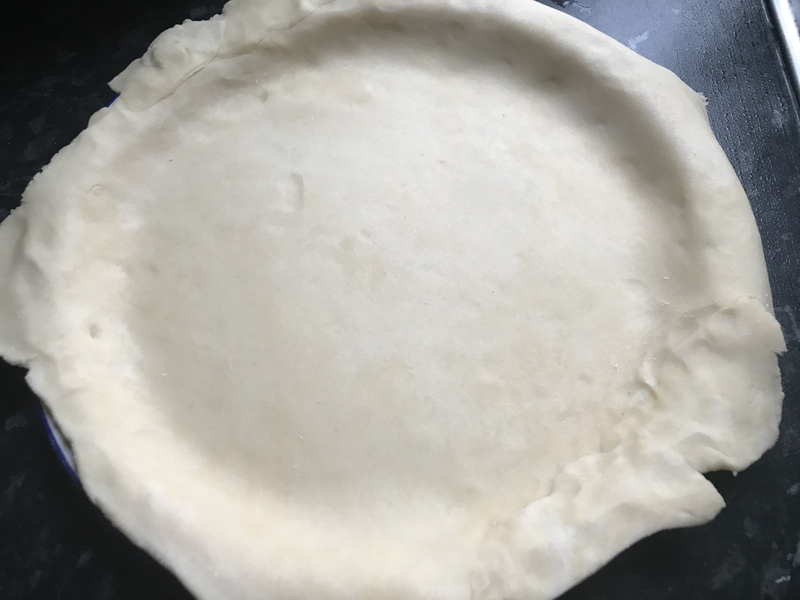 Slice the pastry in half, then roll out the first half into a circle large enough to cover your plate. Lay it on the plate and lightly mould down the sides and edges. Spread the apple filling on top. Don’t over fill here – any leftover fruit can be used for something else. Keep the fruit level with the sides of the plate, no higher. Roll out the remaining pastry and place on top. 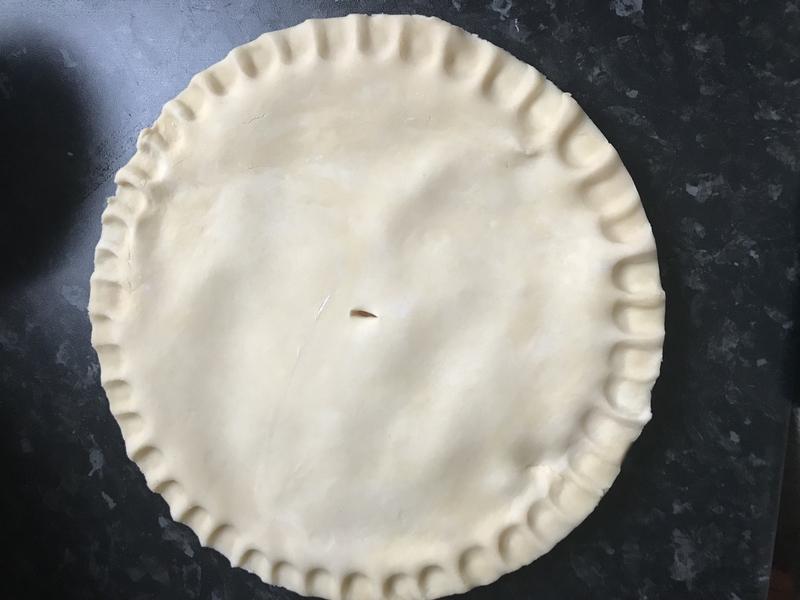 Use your thumbs to press the pastry edges together, then use a sharp knife to trim the edges. Finally, slit a small hole in the centre to allow the steam to escape. Neither Jean nor Granny ever glaze their pie, so I didn’t either. Bake at 180c for about 40 minutes until golden and obviously cooked through. When done remove from the oven and immediately sprinkle with caster sugar, then leave to cool slightly. Any leftover pastry can be used to make tarts, turnovers, cheese straws, cinnamon straws….whatever you fancy. The verdict? Excellent attempt! This is the best pastry I’ve made in years. I’m not saying it’s up there with Granny or Jean’s version, but I’m pleased with my efforts. It’s very important to me to take a family tradition and introduce it to my son, even if I’m not a Foster. 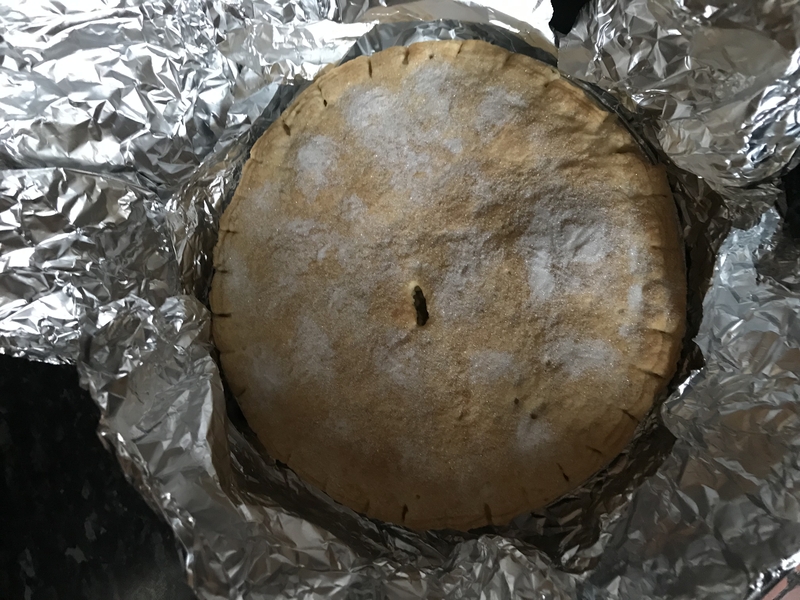 My mum also makes plate pies though hers tend to have redcurrants in them – for me, this simple, comforting pudding is the taste of Sundays, Desert Island Discs and Antiques Roadshow. Food is such an important part of how families, and memories, are made. To make the pastry, blitz the flour, lard and margarine in a food processor until thoroughly combined. Tip into a bowl. Add a few tablespoons of cold water and draw together with a blunt-edged knife until claggy – add more water as required. Bring the mixture together with your hands. Knead lightly to combine then press into a disk, wrap and refrigerate. 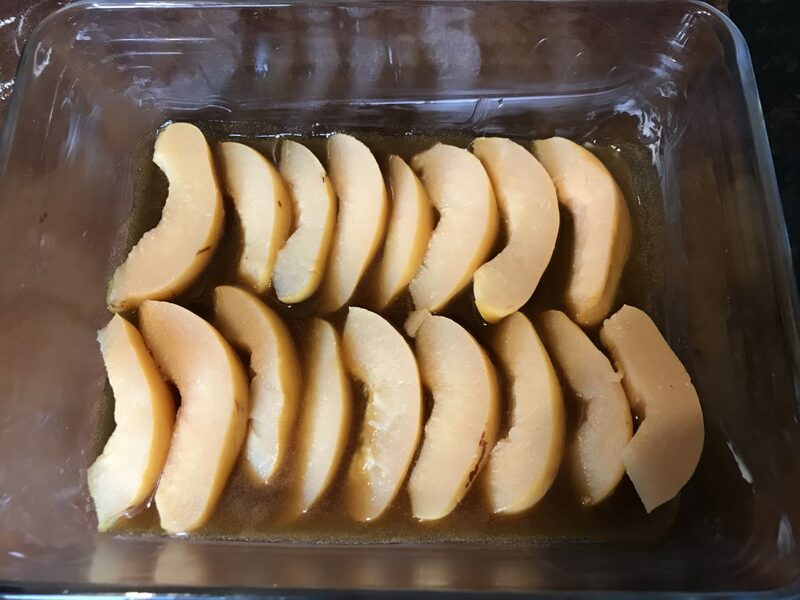 To make the filling, peel, core and slice the apples into thin slices. Tip into a pan with 2 tablespoons of water and 1 tablespoon sugar. Cook on a medium heat until pulpy. Taste and add more sugar if required. Chill for at least 30 minutes, until cool. Preheat the oven to 180c and have ready your oven-proof plate. Roll out half the pastry and use to line the base of the plate. Spread the filling on top, until level with the sides of the plate. Roll out remaining pastry and place on top, sealing the edges with your fingers. Trip the edges with a sharp knife. Cut a vent hole in the top. (Use any remaining pastry to make tarts, cheese straws etc). Bake for 40 minutes until golden. Sprinkle with caster sugar when hot. 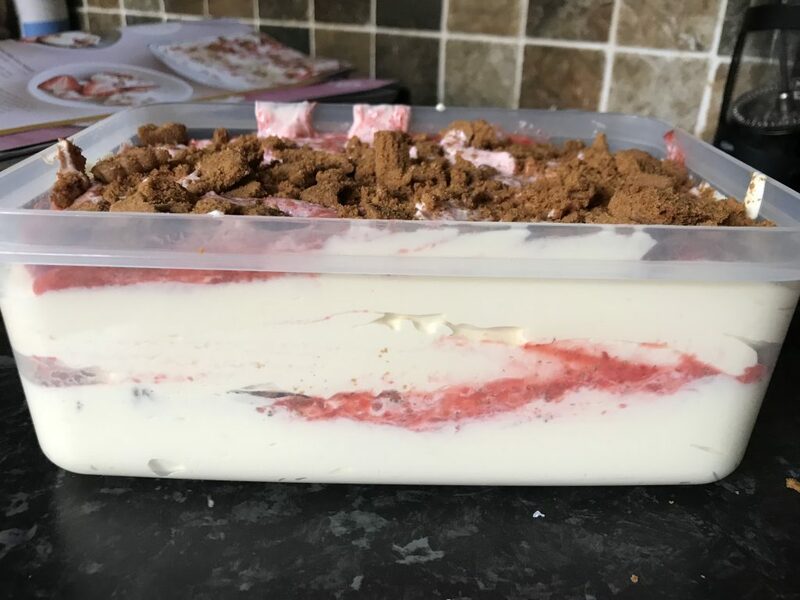 Serve hot or warm with cream, custard or ice cream. 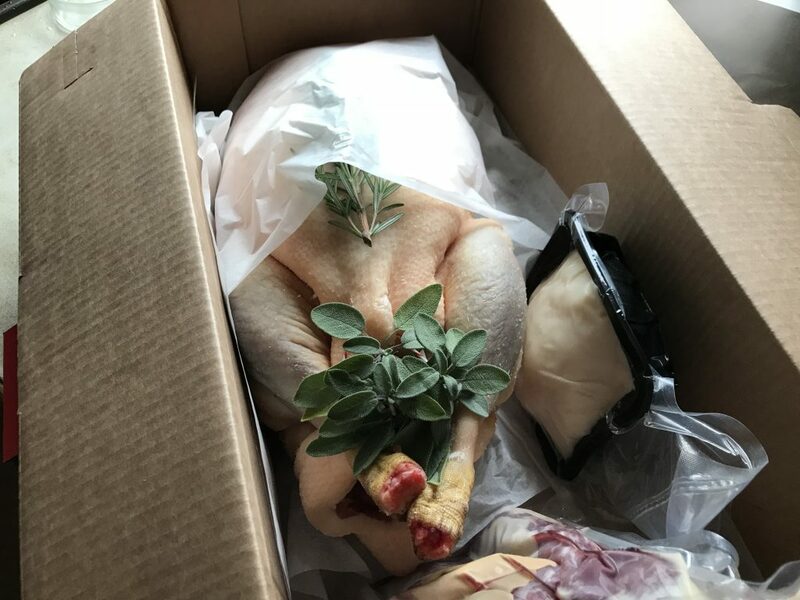 Cooking and eating: Pheasant braised in spiced orange juice, baked sausage ragu pasta, beef bourguignon pie, go-to chocolate muffins. Reading: The Nordic Baking Book by Magnus Nilsson, Today We Die A Little – the biography of Emile Zatopeck by Richard Askwith, a re-reading of The Light Years by Elizabeth Jane Howard for some Cazalet family escapism. Also: Back to work properly after the pre-Christmas lull. Ordering this year’s cut flower and veg seeds. Using the NHS for my continued hand, foot & mouth issue and Matt’s dodgy chest. 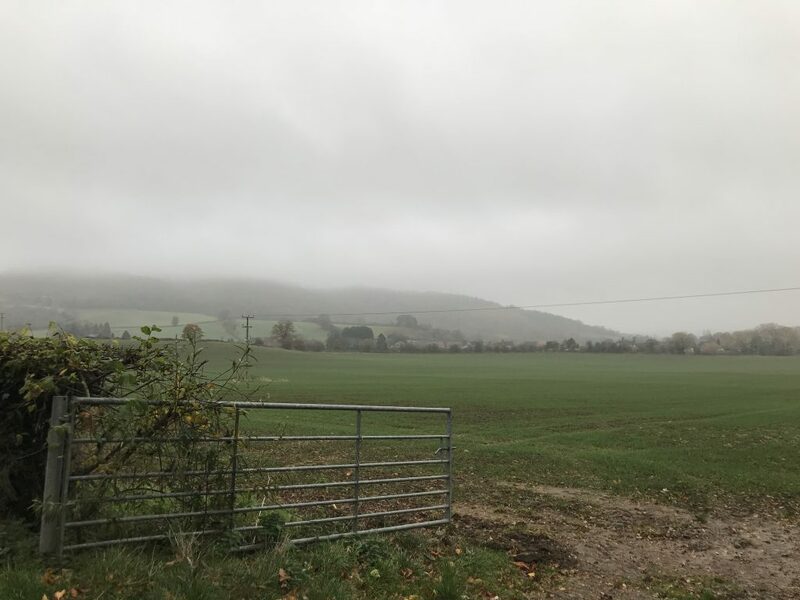 The frugality challenge has been true to its name this week – a challenge. 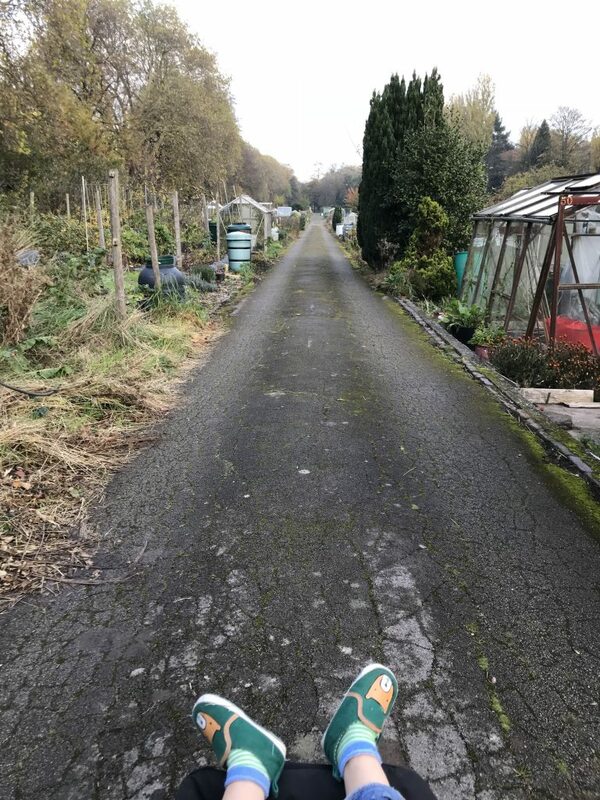 On Day 8 I took a trip to London and was reminded how, when you set one single foot out into the capital, money is hoovered out of your wallet. Consumerism rules for urbanites, from morning coffee to the after-work pick-me-up. 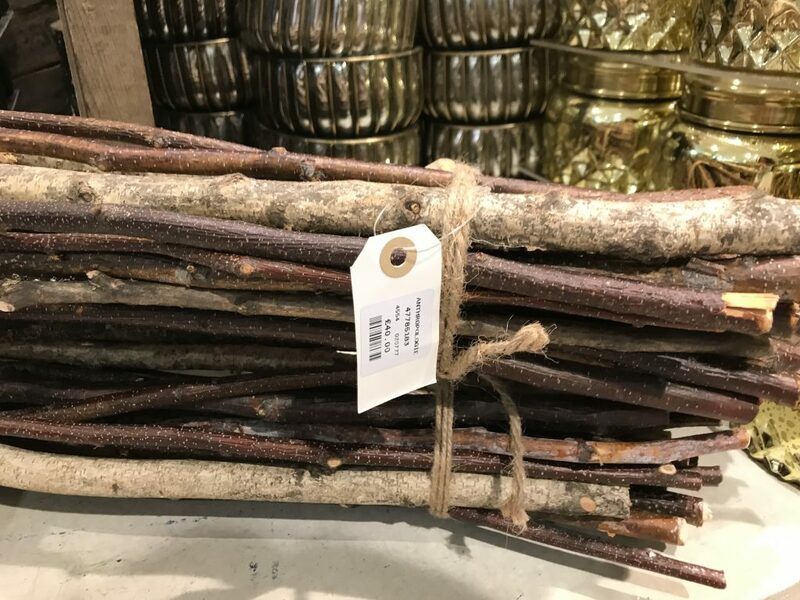 Take as evidence this decorative bunch of sticks – literally a bunch of sticks – for sale in Regent St for the princely sum of £40. £40 for some twigs. Christmas madness folks! By day 10 I needed to do a proper shop. I did an Ocado order for the big/heavy stuff, like cat food and tins of tomatoes (£71, pretty normal), and then headed to Aldi for milk, butter, wipes and nappies, and to the local Halal shop for bananas and herbs. Altogether the ‘top up shop’ came to £25, which seemed alot, and I reflected that there was nothing profligate in this shopping bag; it’s not like I was filling up with Taitinger. Life has become expensive now we’re three, even when you shop at Aldi. 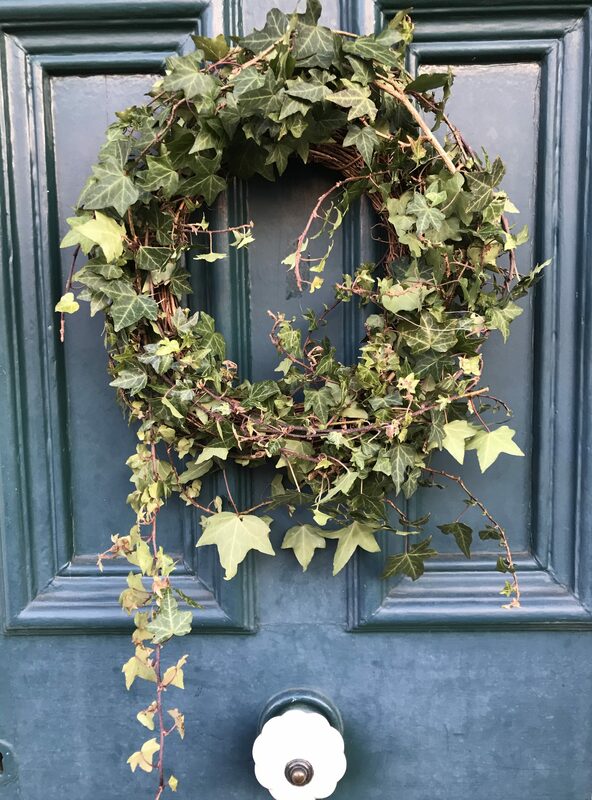 I offset my grumpiness by making my own Christmas wreath, using ivy from the garden. 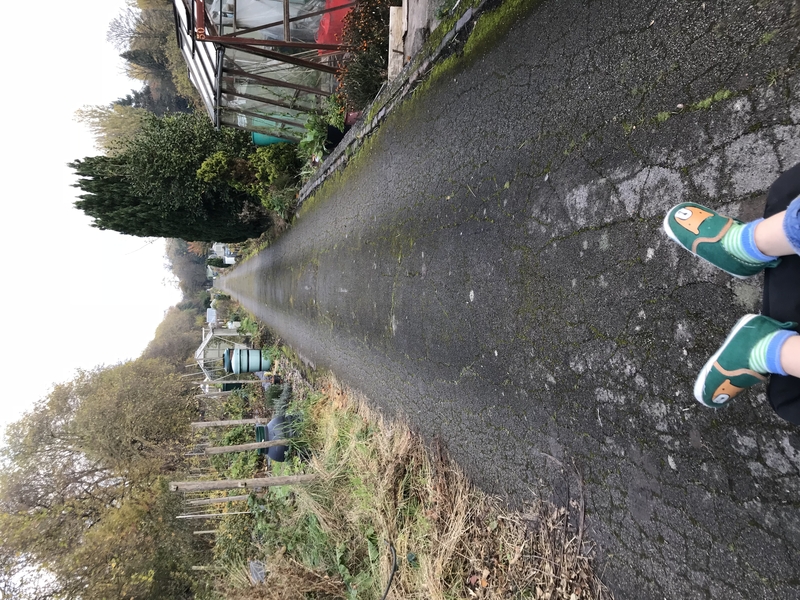 The shopping highlight of the week was a trip to a local nursery for a potted Christmas tree, where I also stocked up on some potted daffodils, hyacinths and veg. £10 buys us loads and reminds me that independent rural food shopping is the best there is. Total for the week: £144.50. It’s less than normal and we’re still eating really well but I see that mindful shopping is making me mardy about consumerism. Let’s cheer things up with some good December comfort eating. Earlier in the week I made my lamb with quince recipe, using those quince that I bought from the Halal shop a few weeks back. I used the leftover fruit as a base for a sticky toffee pudding, giving a lovely bit of fruity interest amidst the dense sweetness of sponge and toffee sauce. 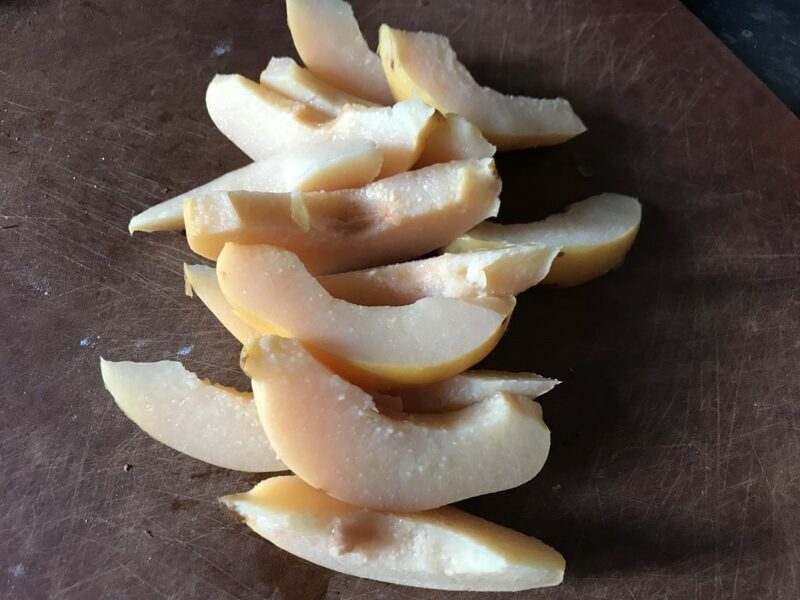 If quince are not to hand, which is most of the time, this would also work with firm apples or pears. This recipe is a total keeper. First, find yourself a few quince. Poach them in simmering water until softened (about 15 minutes), drain, then allow to cool. Core and cut the fruit into wedges. Next make a simple caramel sauce. 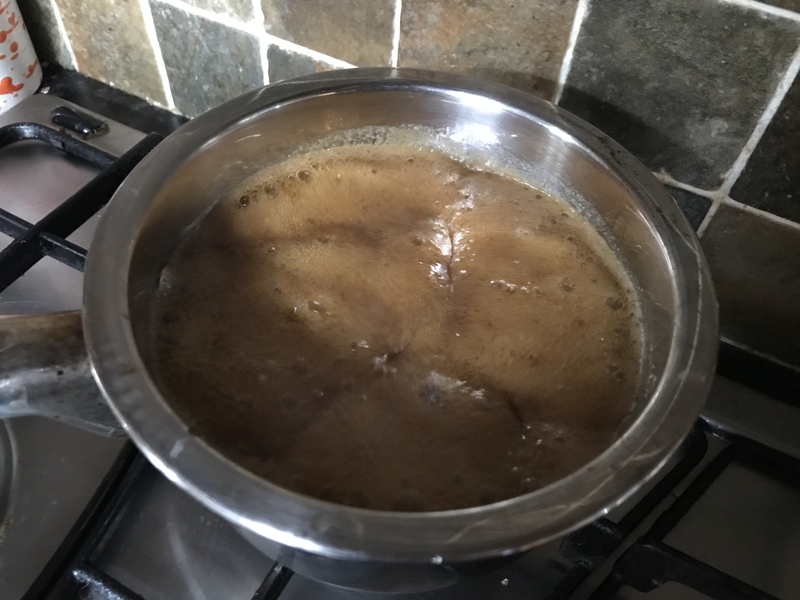 In a small saucepan, melt together 115g unsalted butter, 75g caster sugar, 40g dark muscavado sugar and 140ml double cream. Bring the lot to a simmer and reduce until thickened, about 5 minutes. Remove from the heat to cool slightly. Preheat the oven to 180c. Find yourself an ovenproof baking dish (I use a lasagne dish) and butter it well. Pour in a drizzle of caramel sauce, lay the quince on top, then drizzle more sauce on top (leave some sauce back to serve with your pudding). Then put the dish in the fridge to firm up whilst you make your sponge. 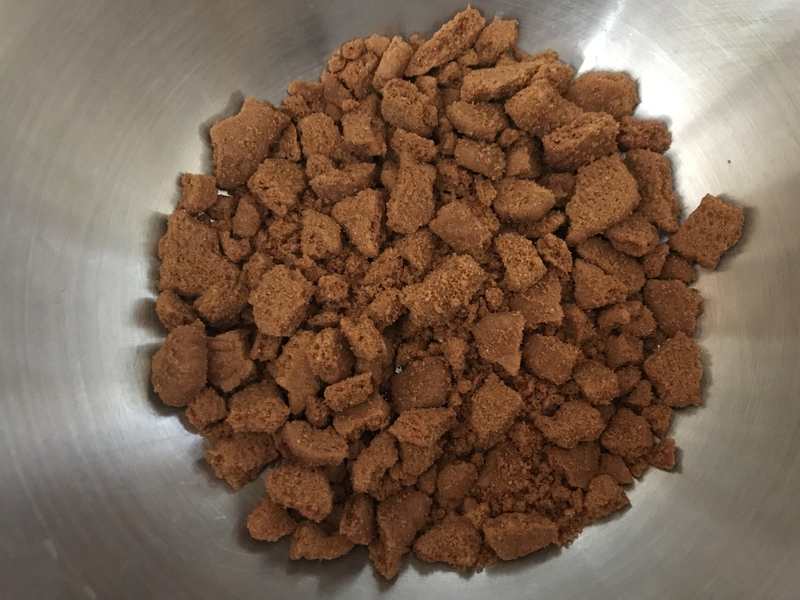 For the sponge, take 100g stoned dates, chop them roughly, then place in a bowl with 1 tsp bicarbonate of soda and 275ml boiling water. In a separate bowl, beat together 50g unsalted butter with 80g caster sugar and 80g dark muscovado sugar. In yet another bowl, measure 175g flour with 1tsp baking powder, 1/2 tsp cinnamon and a small pinch of salt. Alternatively beat 2 eggs and the flour into the sugar-butter mixture. Stir in the dates and their water. Mix well. Pour the sponge mixture on top of the sliced quince, then bake for about 40 minutes until firm and risen. Serve warm with the remaining toffee sauce and ice-cream. I prefer Mackay’s plain but you could go for vanilla. Bake the lot together until risen and burnished. Serve with extra sauce and plain ice cream. 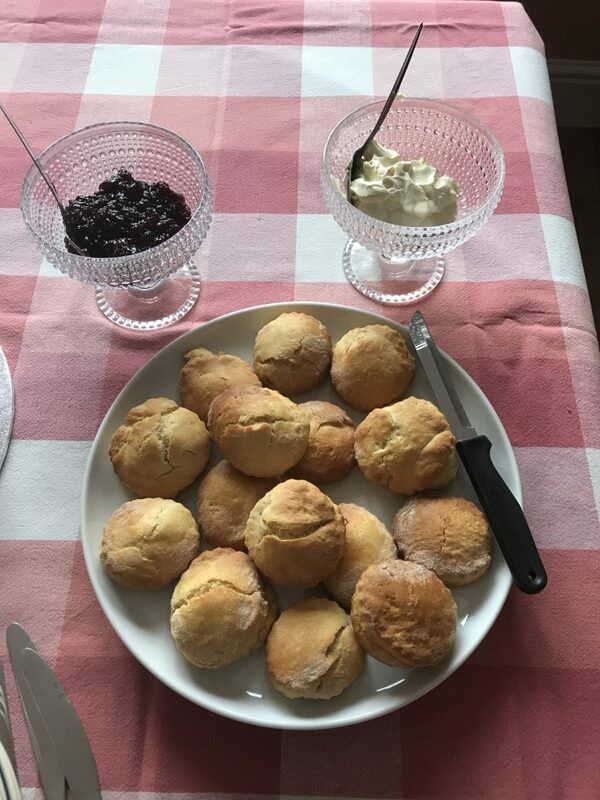 Cooking and eating: Amazing Danish pastries from Ole & Steen in Marylebone, doughnuts from St John’s in Covent Garden, lamb with quince, Tune’s egg curry with roasted cauliflower and roti, homemade mince pies, tons of stollen and panettone, the first brandy cream of the season. Reading: A Christmas Carol by Charles Dickens, which has the best food writing I have ever read. I can’t believe it’s taken me so long to get around to reading this classic. 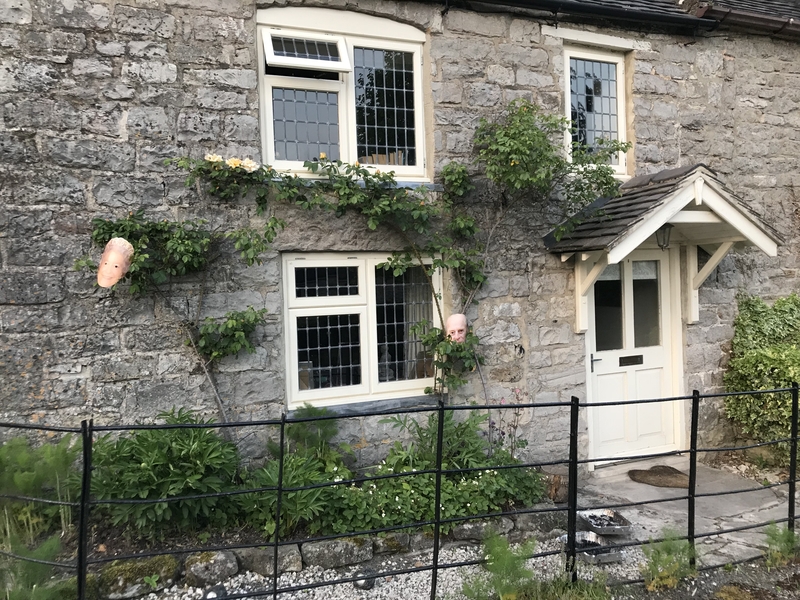 Our house needs a big red cross on the front door: once again we are diseased. Well actually it’s not that dramatic – potentially a bit of hand, foot and mouth, except Harry’s spots are on his bum, knees and mouth. I haven’t googled “bum, knees and mouth childhood illness” as I’m pretty certain it’s new to science. Whilst Harry’s potentially infectious and therefore off nursery, I’ve been mentally bouncing off the walls at being nearly-housebound. The worst is over so today we even went to Ikea out of desperation. In the meantime, autumn has taken hold and Birmingham is bathed in golden colour. It’s good to pay attention to these things…the changing light roots me into the passing of the seasons. We’ve had a few frosts now which have finally meant the end of the cosmos – the Cosmos Purity and Dazzler gave me blooms from June to November, which is pretty impressive. 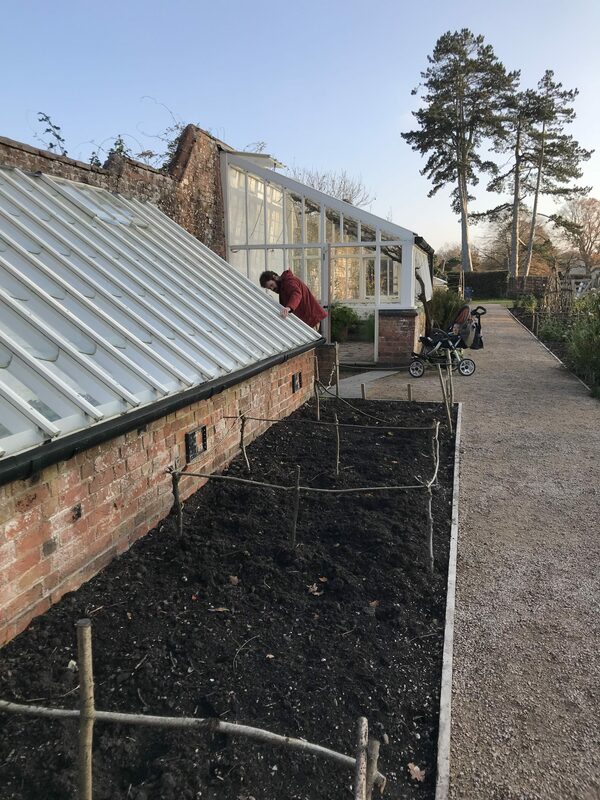 A week or so back I managed to take out the remaining plants from the one veg bed and get some black plastic down, to protect the soil from the worst of the winter weather and limit the weeds. 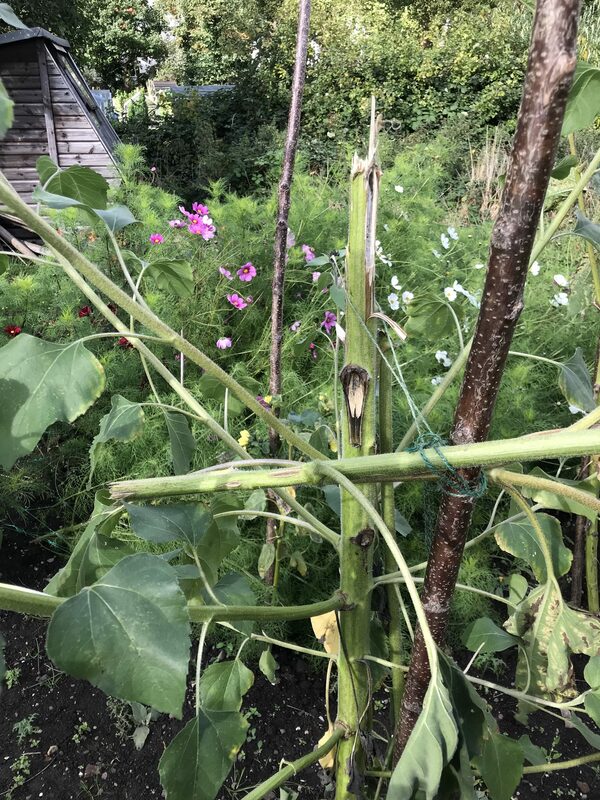 Keeping the plastic in place is always a feat of “that’ll do” – pegs and staples are useless here, so I use any bits of heavy material I can find including, this year, the hopolisk, some discarded fencing and (my favourite) a marrow. 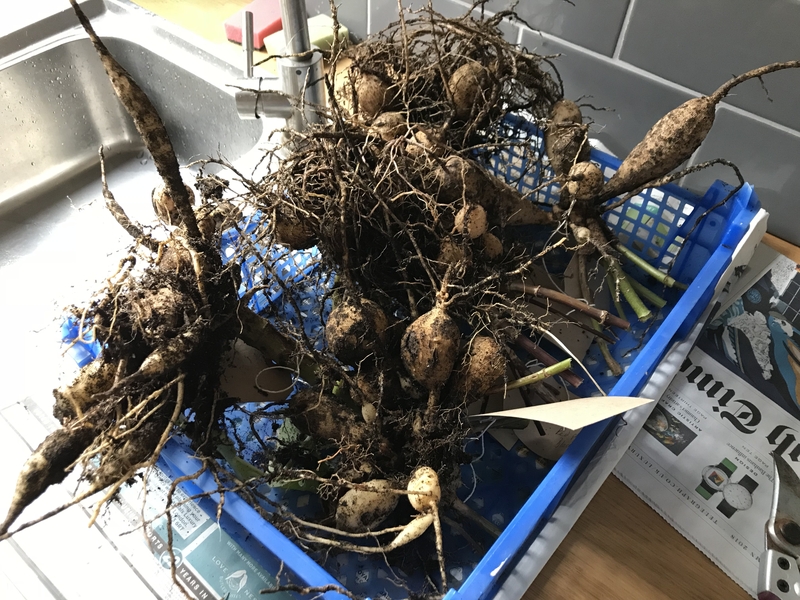 Without really meaning to, I have become the proud owner of a gazillion dahlias – none of which are in the right place. The ones at home have now been dug up so that I can over-winter them indoors and replant in the spring. The allotment ones also need to come up (just need to find the time) and they will get the same treatment. All this is diversion from what Harry and I spend most of our poorly time doing, which is cooking. 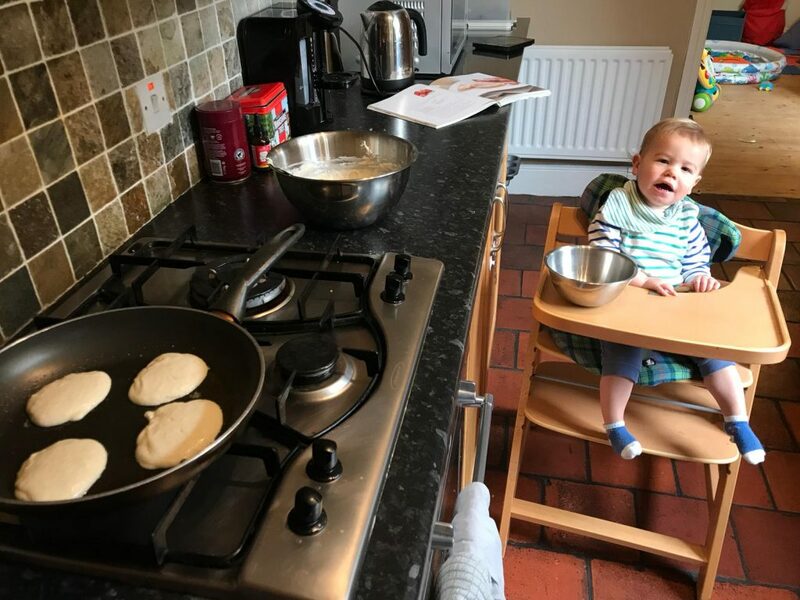 Every morning I plonk him in the high chair so he can watch me concoct something – today it was a lentil and vegetable stew, which he later scoffed very happily, and yesterday it was a parsnip and cheddar soda bread. 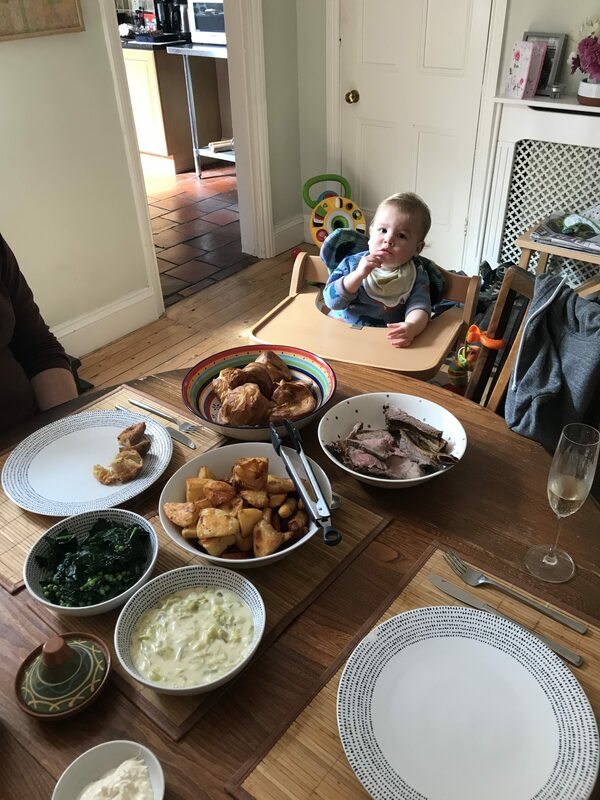 I know that he’s very young to be indoctrinated into Stallard cookery but I like to think that he will learn by osmosis. One of his favourite treats of recent weeks has been an Irish Whiskey Cake that was leftover from the cake table at our wedding. 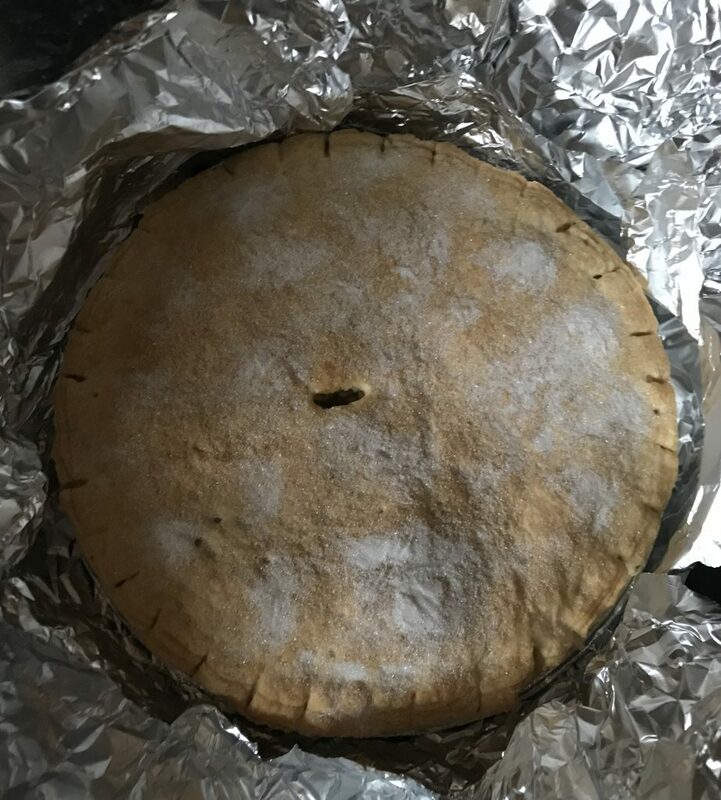 He (and I) liked it so much that I pumped my friend Felicity for the recipe, which she in turn had to get from Mrs Audrey Flint from Smethwick Old Church. 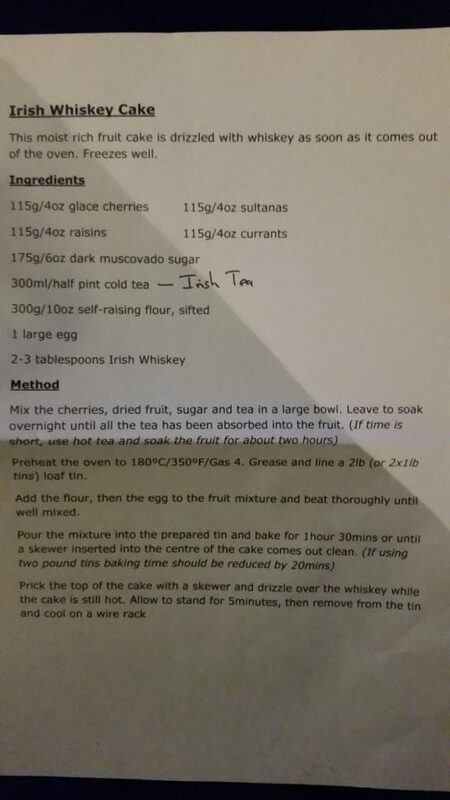 Audrey very kindly came up with the goods, and I discovered that my naive assumption that the whiskey would have been baked into the cake was wrong wrong wrong. 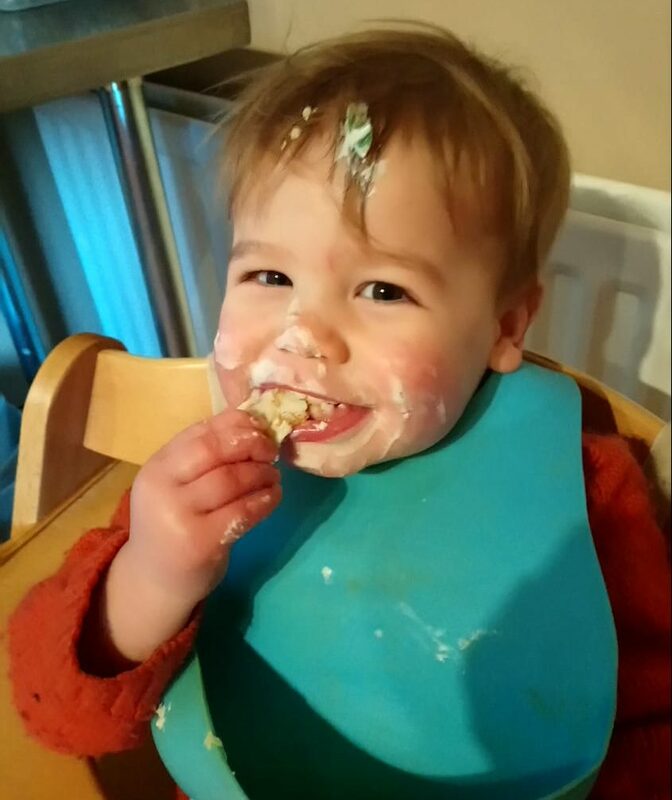 It’s actually a tea bread, and the key ingredient is drizzled on after cooking to increase the moisture content…which means that my son has started his boozy life extremely young. Here is Audrey’s fine typed-up version, which I see no reason to re-type as I can not improve on this excellent piece of food culture. Thank you Mrs Flint for carrying on the fine tradition of simple yet richly fruited, boozy loaves that keep forever. 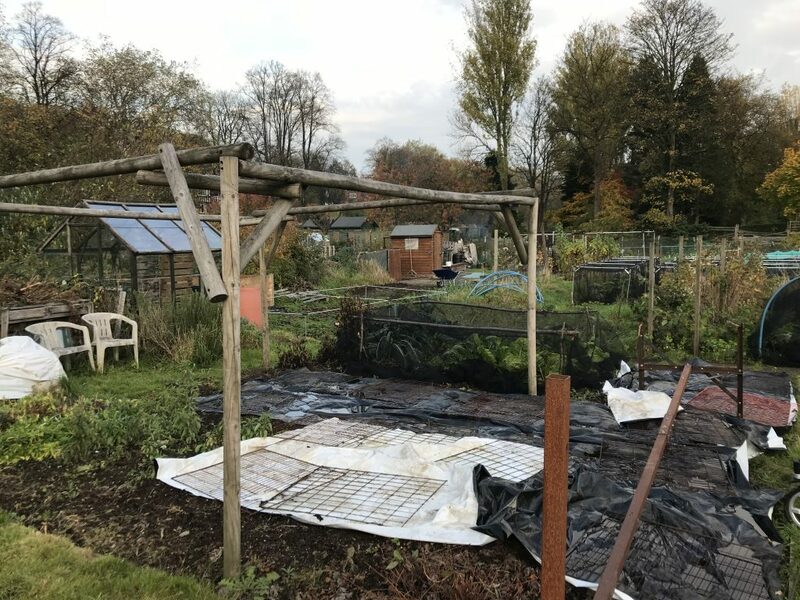 On the allotment: Covered one vegetable bed with plastic. 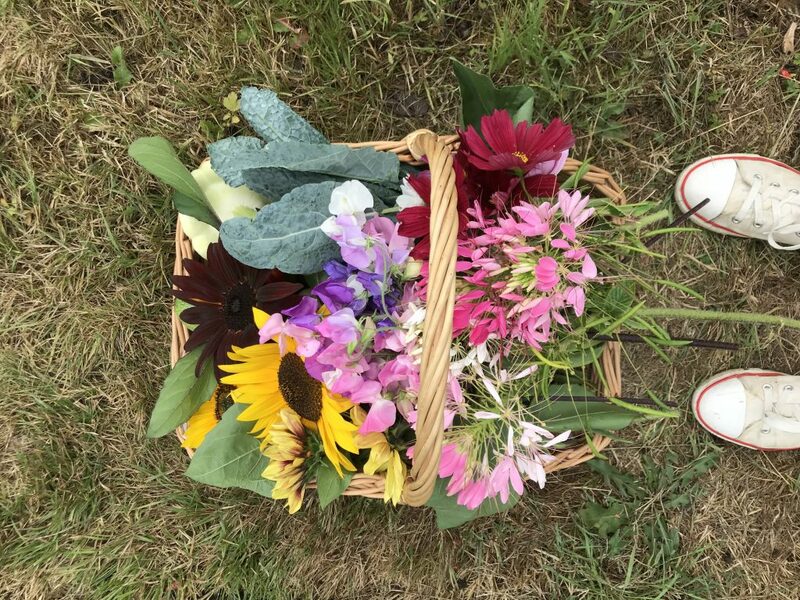 All the cut flowers are now finished, but still harvesting chard, beet spinach and cavolo nero. Cooking and eating: Chocolate Eve’s pudding, parsnip & cheddar soda bread, banana muffins, lentil and vegetable stew. It’s been a fortnight of partying, working and gales. 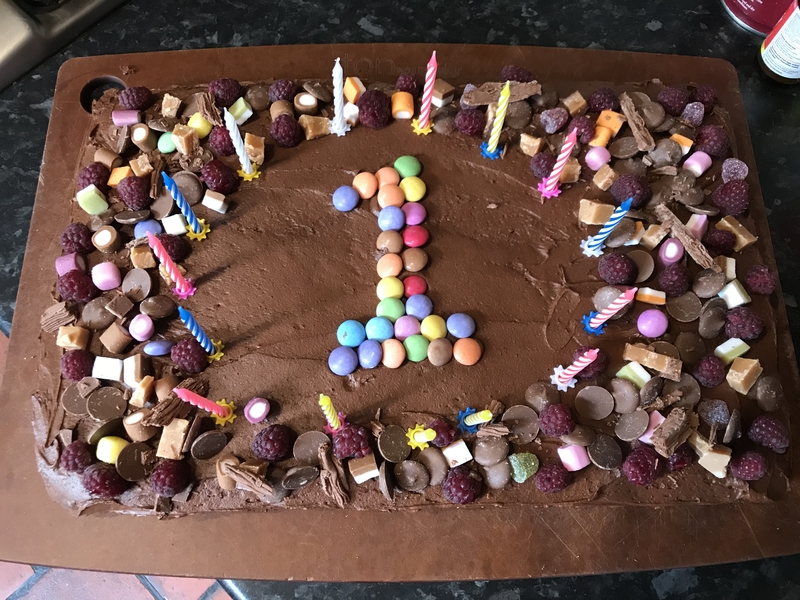 Harry had yet another birthday party, complete with chocolate fingers and more cake; I had my third (THIRD!) hen party ahead of this weekend’s nuptials, then I got busy working on Festival of Imagineers in Coventry. In the meantime, the weather gods decided to do their best to destroy the wedding flowers. 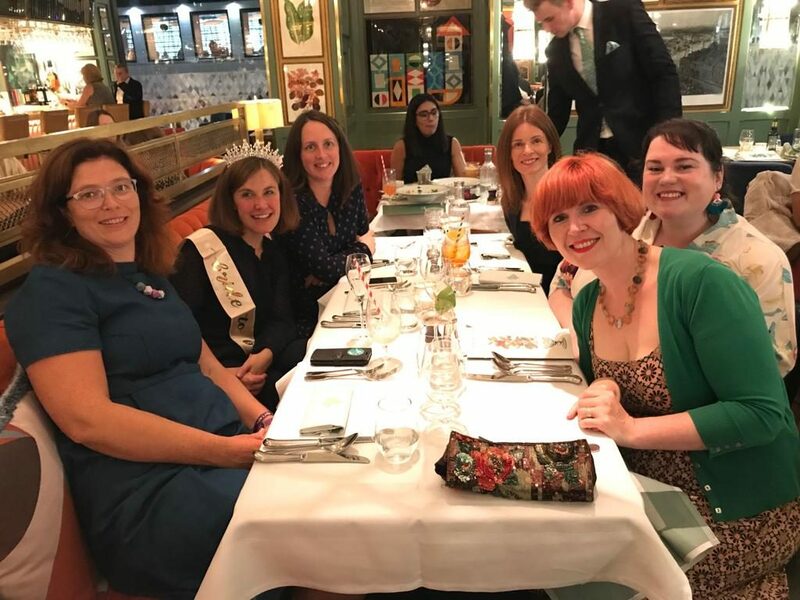 A hen do with my Birmingham pals, aka the Supperagettes. I was forced to wear that tiara. Last week’s gales mean that the sunflowers have been battered and the cosmos now lie essentially flat on the ground. After much debate, I am leaving them where they are – it will take at least two people to stake them again (which is logistically impossible) and actually the cosmos can be trimmed to go into pint-sized jars and still look pretty. What drama is involved in growing wedding flowers, and mine are just the back up! 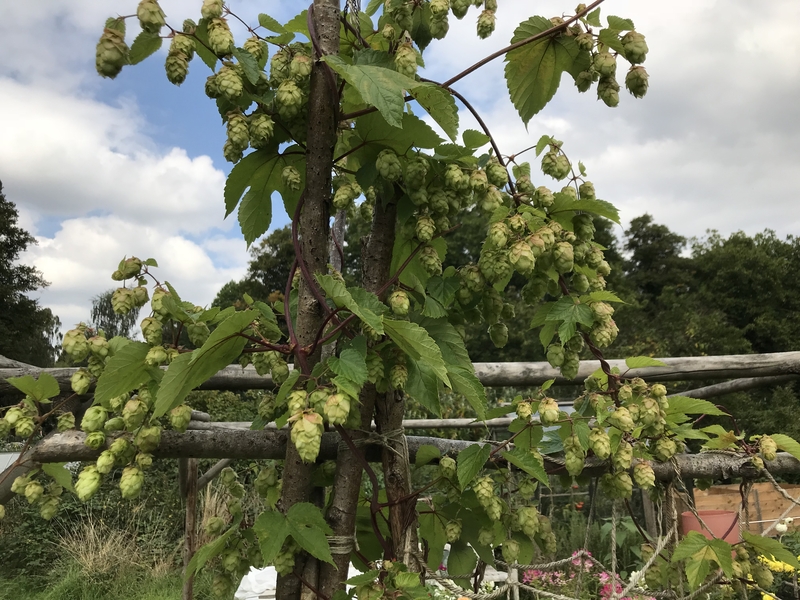 Every season I find new respect for the people who grow for a living. 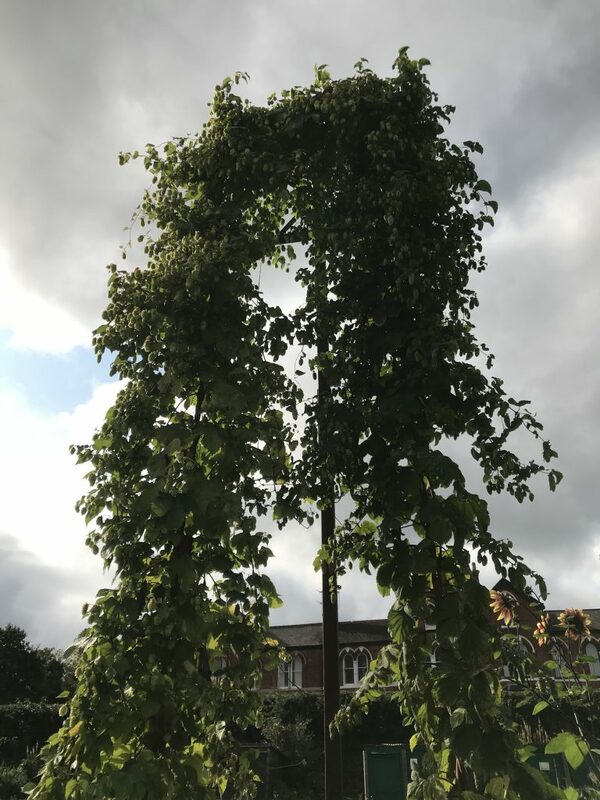 …but the thick, big stems were the least resistant. 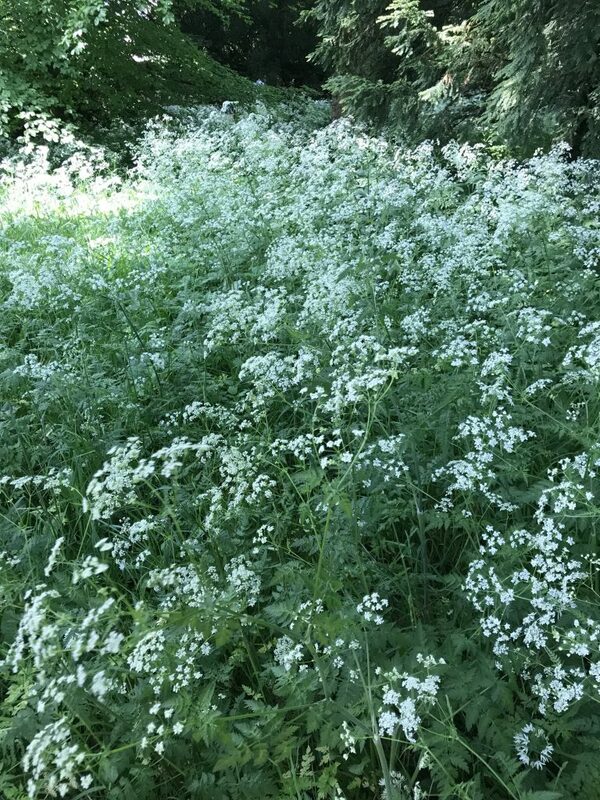 After a few days of heads-down work – and after the rain eased – I indulged in a little light foraging. 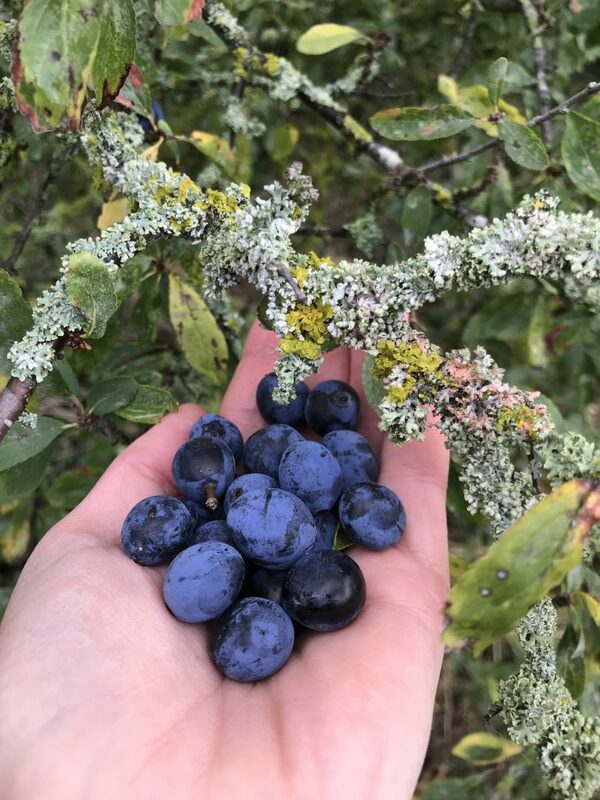 There’s a secret place in Broadway where you can find the best sloes. I could tell you where it is…but I won’t. 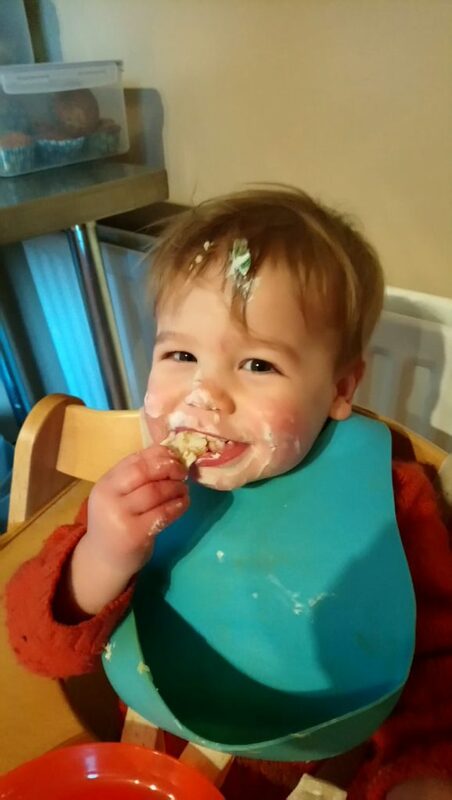 Today’s recipe has become a Harry favourite. These lemon ricotta hotcakes are from my favourite Bill Granger Sydney Food cookbook – or at least, I thought they were from there, but on closer examination he uses ricotta NO WHERE in any of his pancake recipes. I had made it up entirely. 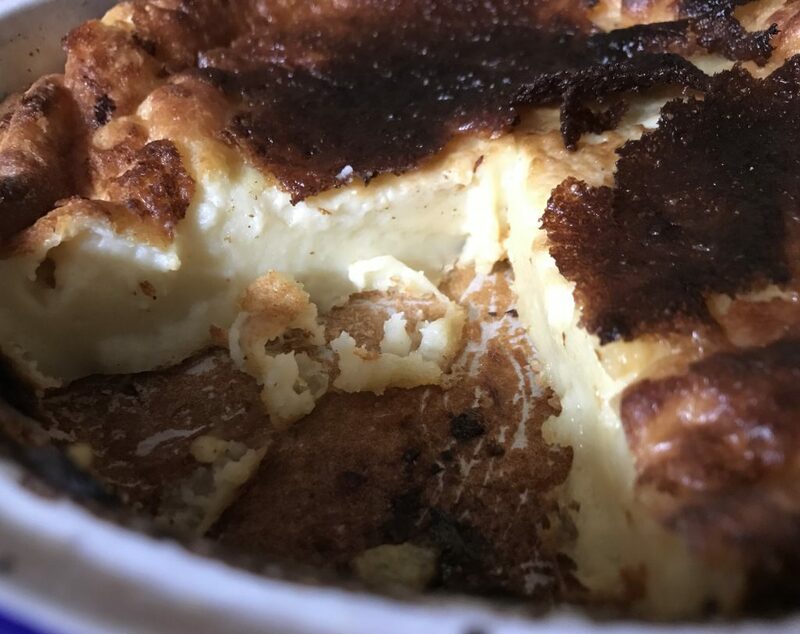 So I used his recipe for a souffle-style pancake, subbed in some ricotta, and came up with something new. On the one hand, they’re a good way of getting extra calcium into the baby whilst having a supply of easy snacks in the fridge. On the other, they taste of summer whilst being comfortingly warm and cosy. Melt the butter in a heavy-based frying pan (the one that you’ll cook your hotcakes in) then remove from the heat to cool. In a bowl, mix together the ricotta, egg yolks, lemon zest, juice, and vanilla. In a larger bowl, sift together the flour, baking power and sugar. In yet another bowl, whisk the egg whites until stiff. Whisk the ricotta mixture into the flour until well mixed. Add the egg whites in batches, folding through with a large metal spoon, until combined. Loosen with a little milk if it needs it. Finally, gently stir through the melted butter. Heat the frying pan over a medium heat and drop in a dollop of batter to make one pancake – flip when the underside is golden brown. Repeat until all the hotcakes are cooked. Serve with soft fruit. Harvesting: Not so much now. The tomatoes and beans have finished but chard and cavolo nero still going strong. Haven’t harvested any flowers for a week due to work. Reading and watching: The Saffron Tales by Yasmin Khan, Big Magic by Elizabeth Gilbert. Watching The Bodyguard, like everyone else in Britain. I am slowly getting used to the fact that summer has gone. I know we were all whinging about the heat but when the weather broke at end of July, I presumed it would be just a short break before normal 30c service resumed. It was not to be and now we’re in mid-September, wearing long trousers and socks (SOCKS!) and the heating has even been on for a few hours. 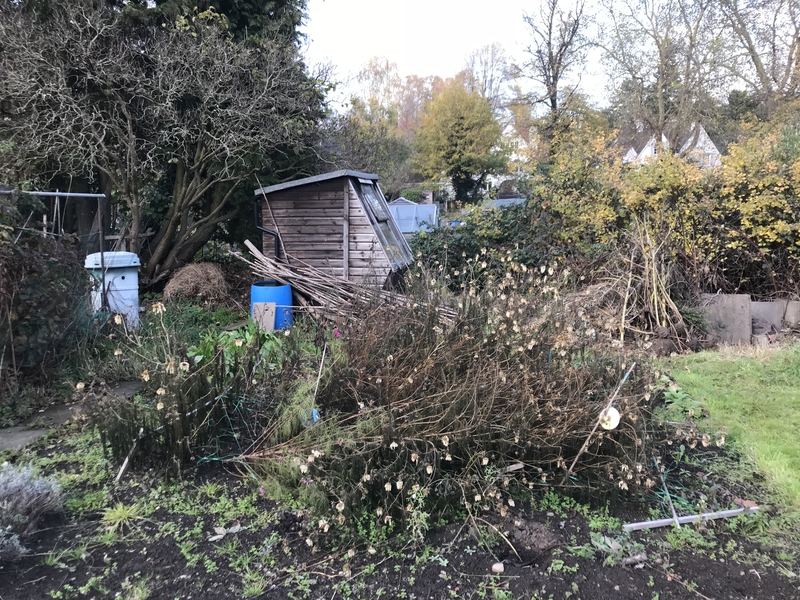 Both the allotment and the back garden have got a bit shaggy and could do with a back-to-school tidy up. This may have to wait until October. The season’s shift means that new produce sits alongside the summer hangers-on. I stocked up with pears and apples at Clives the other week, and the freezer is now re-filled with my Mum’s excellent corn on the cob. 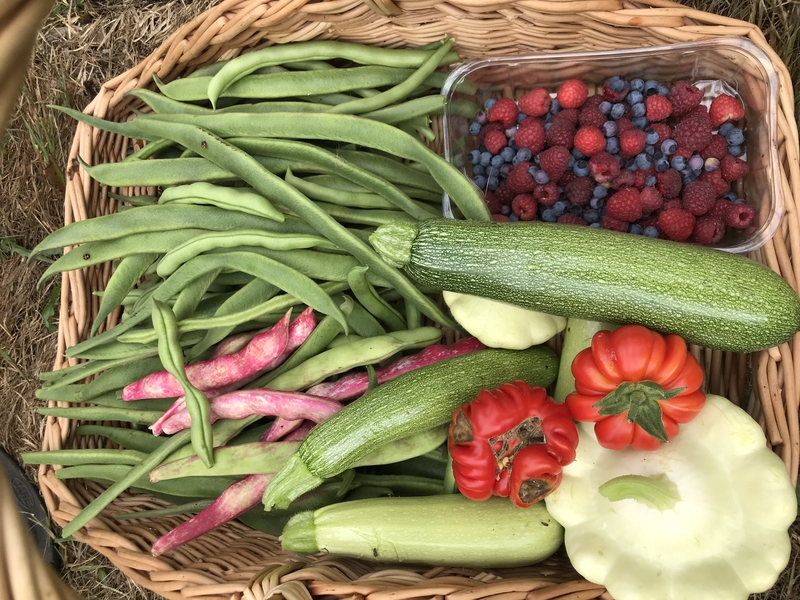 The autumn raspberries have been brilliantly productive this year – got two big freezer bags of those – and the fridge is stuffed with beets, peppers, cavolo nero, courgettes (still) and beans (still). And the tomatoes! So many tomatoes – despite the fact that 50% of the plants totally failed. But onto more pressing matters. 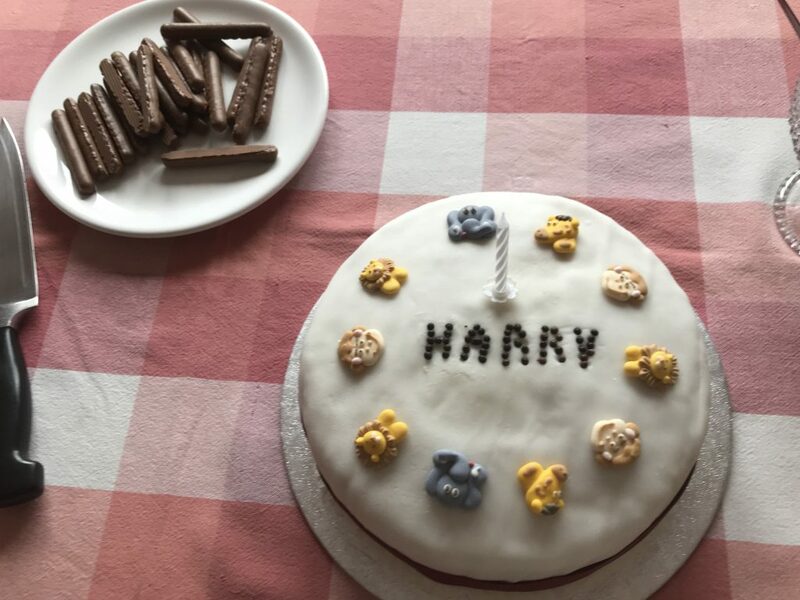 Harry is 1! 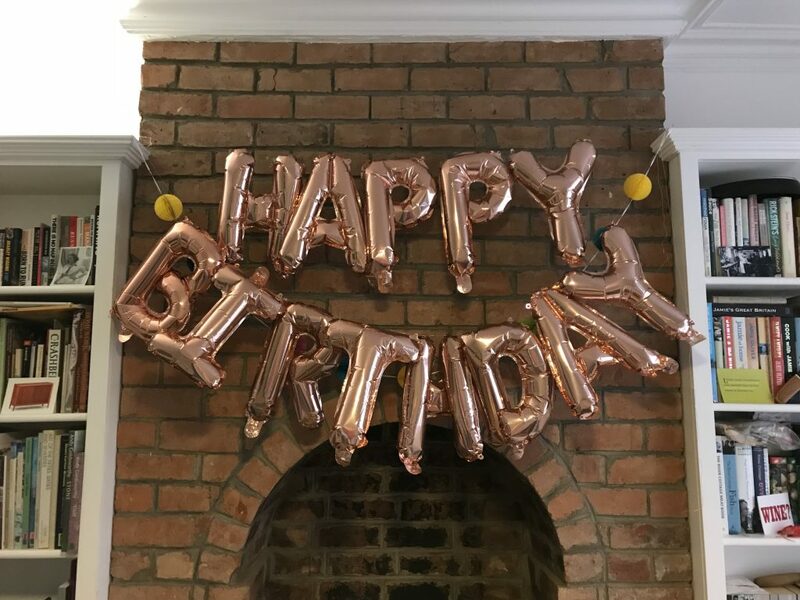 1! 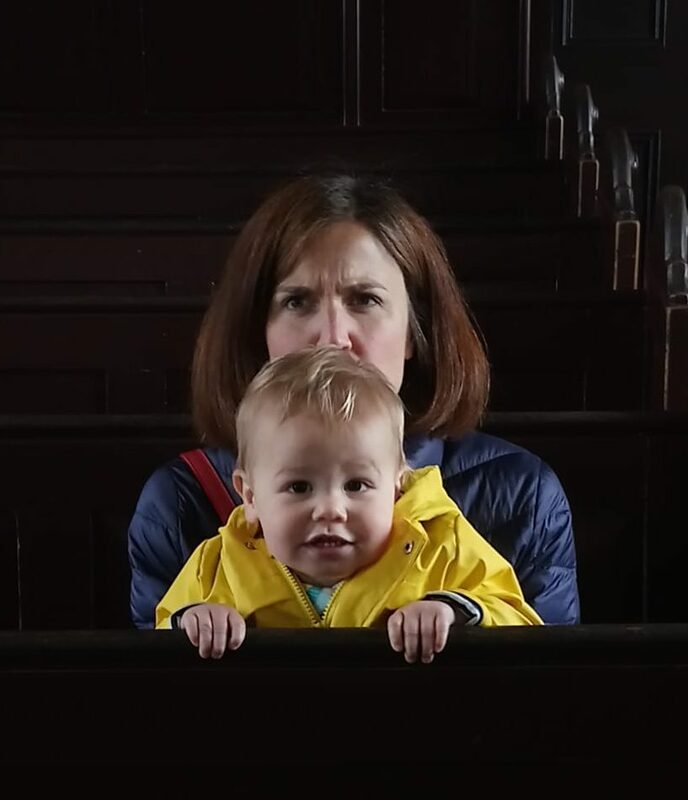 We have kept a human alive for a year with sanity (just about) intact, bank account (just about) intact and relationship intact (getting hitched so looks OK). I went for a tray bake, as it’s easier to decorate and actually is also easier to cut up for a crowd. This one is surprisingly dense and chocolatey, so it keeps adults happy as well as the kids. 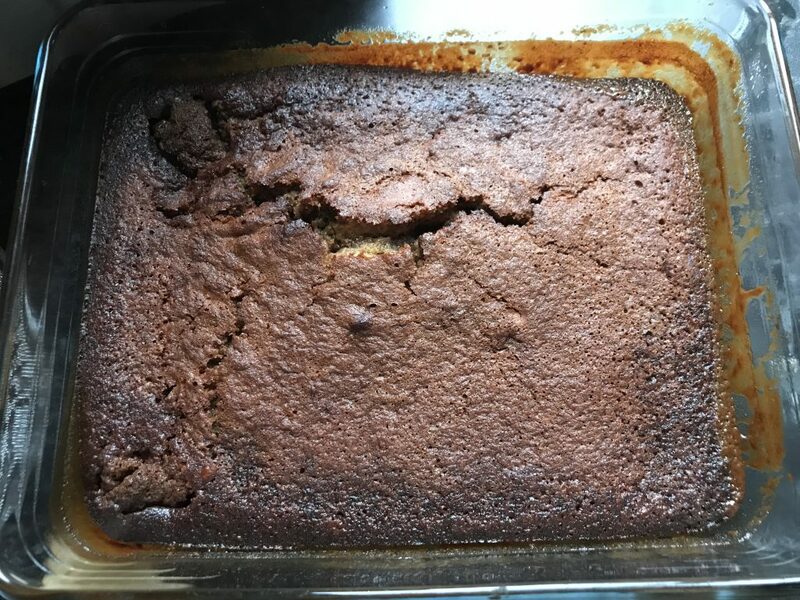 I upped the quantities from the original recipe so that I could bake the cake in our massive roasting dish; use whichever quantities are right for your baking tray. Easy to make, easy to bake, easy to slice. Sorted. The first quantities are for a 20x30cm tray. Quantities in (brackets) are suitable for a 35x25cm tray. Preheat the oven to 170c and line your tin with baking parchment. Melt the chocolate and butter together in a bowl set over simmering water, then leave to cool. Sift the cocoa into a bowl, add the coffee and mix to a paste. Stir in the creme fruit and milk, to make a smooth mixture (it may need a quick whisk to get rid of lumps). In a large bowl, whisk the eggs and sugar until you reach the ribbon stage – this may take in excess of 10 minutes. Use a hand-held mixer or table-top mixer. 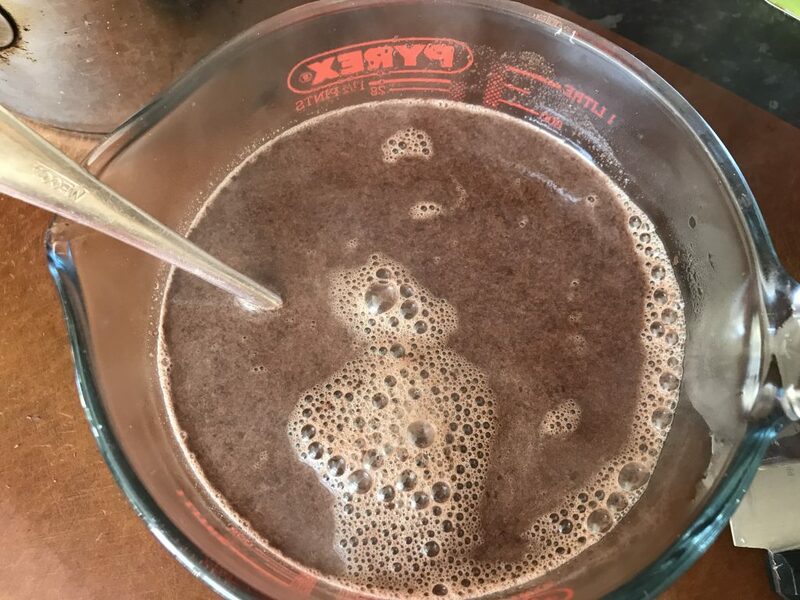 Pour the chocolate mix into the side of the eggs, and whisk to combine. Do the same with the cocoa mixture. 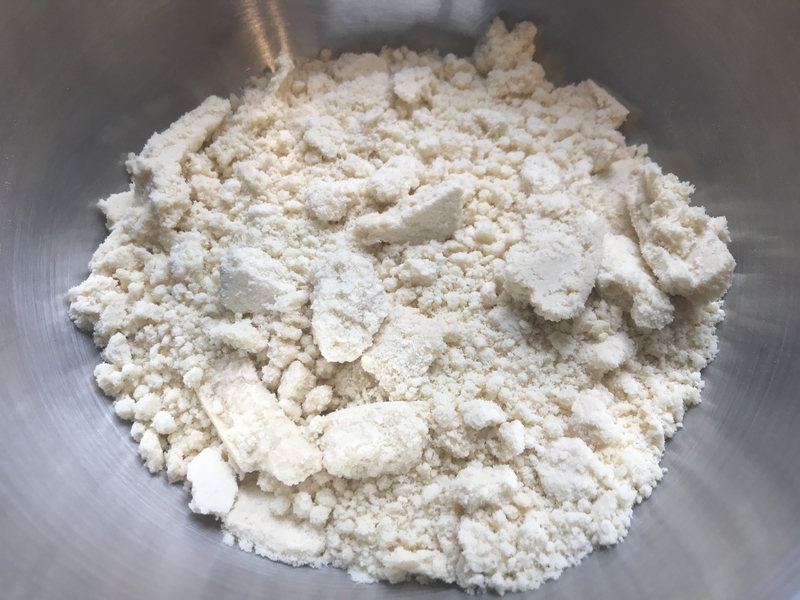 Finally, sift the flour in top with a tiny pinch of salt and fold in, using large metal spoon – you may want to do this in batches. Mix carefully until fully combined, keeping as much air in the batter as you can. Pour into the tray and bake for 25-30 minutes, until firm. Leave to cool completely before decorating. To make the icing, soften the butter in the microwave for 10 seconds or until beatable. Using a hand-held whisk, beat the butter then sift in the icing sugar and cocoa – it will make a massive mess alas – and continue to whisk the hell out of it until smooth and fluffy. Add a splash of milk at this stage to make the icing softer (but don’t add it any earlier as you risk the lot splitting). When ready, use a palette knife to spread the icing over the cake, then decorate as you see fit! Plague has visited the household. Harry brought home – simultaneously – a vomiting bug, a chest infection and a general got-no-energy malaise. The vomit, dear God, the vomit! He’s now fine of course, but I am in day 10 of being decidedly below par. It’s also the time of year when the biting insects reach peak-feasting mode and I succumb to wearing jungle formula to bed. I know we should appreciate the warm but frankly, I am now ready for drizzle, anoraks and things-wrapped-in-pastry. Meanwhile the harvest continues. Beans…so many beans, and courgettes, so many courgettes. 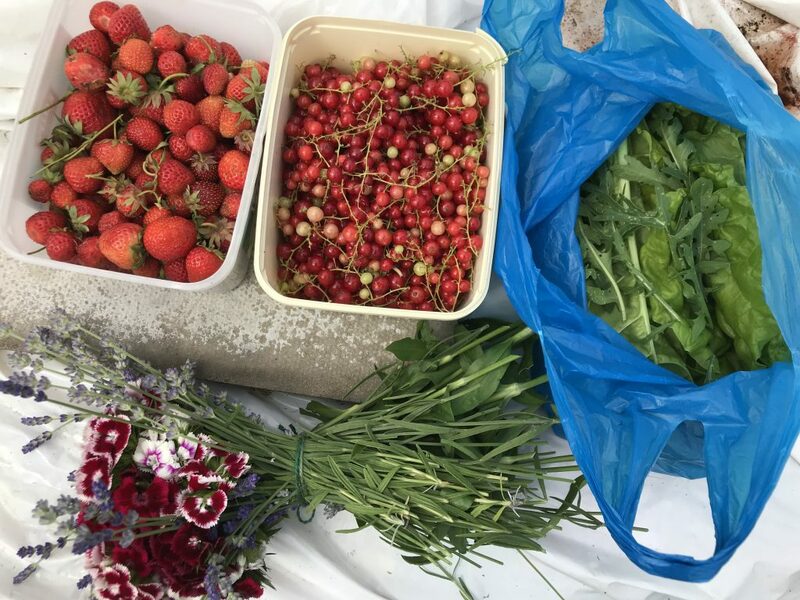 And great-looking chard, cavolo nero, perpetual spinach, raspberries, blueberries, blackberries, and rather less-great-looking knobbly tomatoes. Plus, whilst not armfuls of flowers, enough for a few pretty vases a week. I also am gratefully receiving the fruit of other people’s labour: just look at this whopper of an aubergine! What to do with all these beans! There’s been a good deal of batch cooking this week. Given that I’m still working and am losing about an hour a day to massive coughing fits, I’m not entirely sure how that’s happened, but there it is. Cooking on auto-pilot. I like to keep a good amount of baby food in the freezer, ready to go, to prevent meltdowns at teatime. 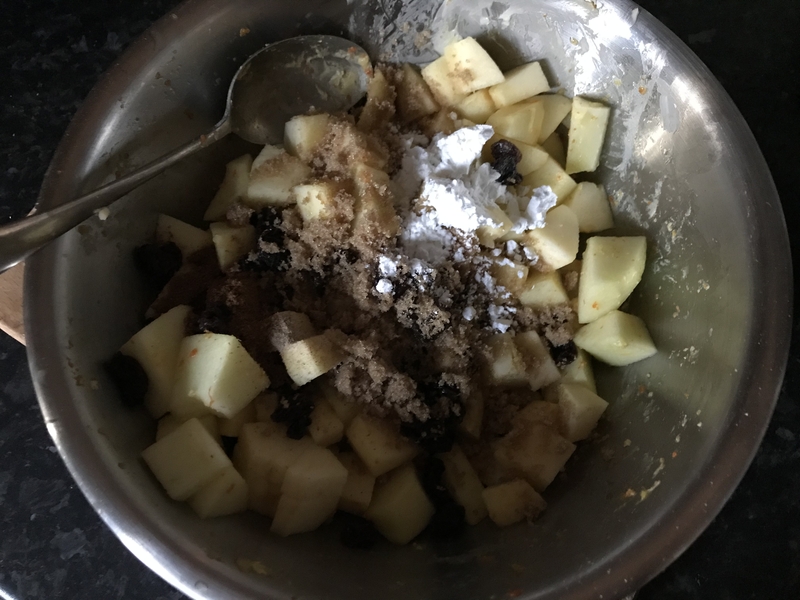 Fruity muffins are useful and I’ve been using this River Cottage recipe from their Baby and Toddler cookbook which, in truth, taste way too much like health food to me, but Harry likes them. The purple juice stains, so you must either strip your child before they dig in, or else surrender your power to the washing machine. I choose the latter. Substitute the blackberries with raspberries, redcurrants, blueberries or apples as the mood takes you. 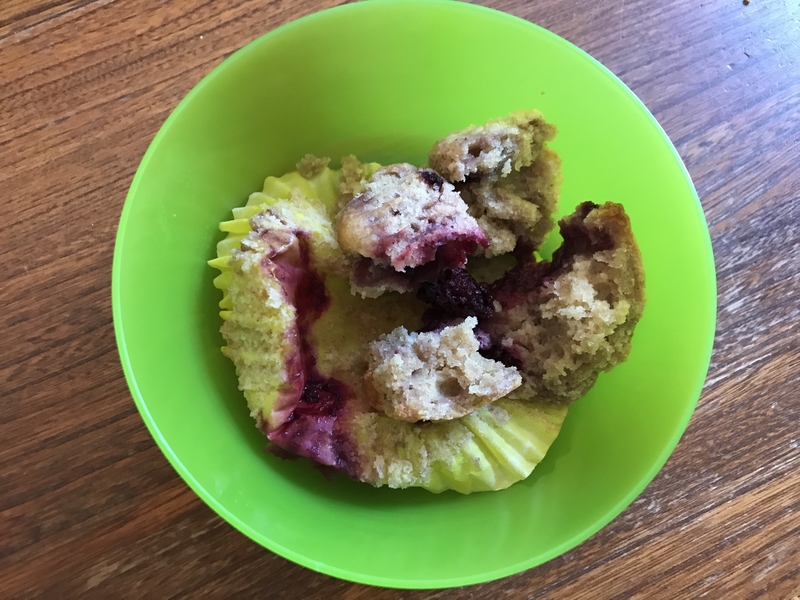 Cooked muffins can be frozen. Defrost at room temperature and maybe given them 20 seconds in the microwave before eating to refresh. Grown-ups may prefer these higher-sugar tayberry muffins instead. Preheat the oven to 180c. Sift together the dry ingredients into a mixing bowl. In a pyrex jug, melt the butter in the microwave until just melted. Using a fork, whisk the egg, milk and yoghurt into the butter. Add the milky mixture to the dry ingredients and stir to combine (I use a wooden spoon for this). Stir in the blackberries. Dollop the mixture into muffin cases and bake for about 20mins or until golden. 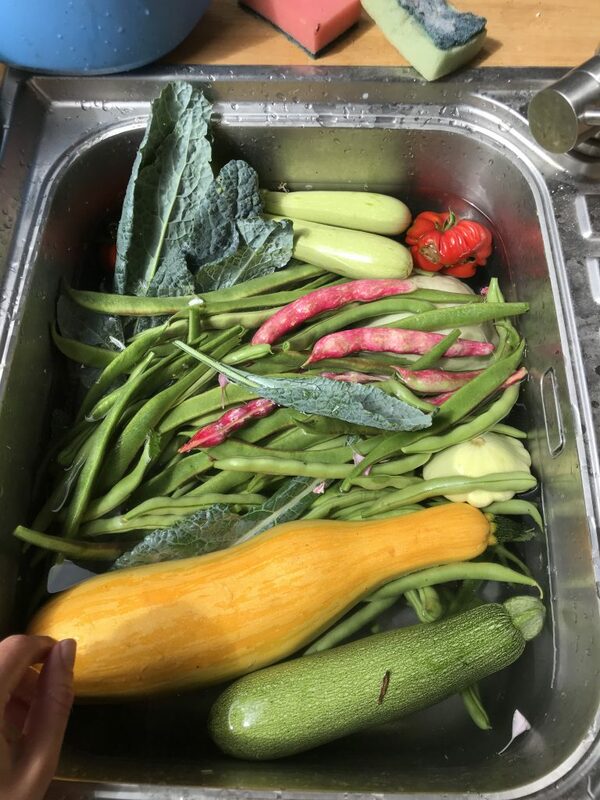 Harvesting: last French beans, runner beans, chard, perpetual spinach, cavolo nero, courgette, tomatoes, raspberries, blackberries, blueberries, cleome, sunflowers, cosmos, rudbeckia, dahlia, sweetpeas. 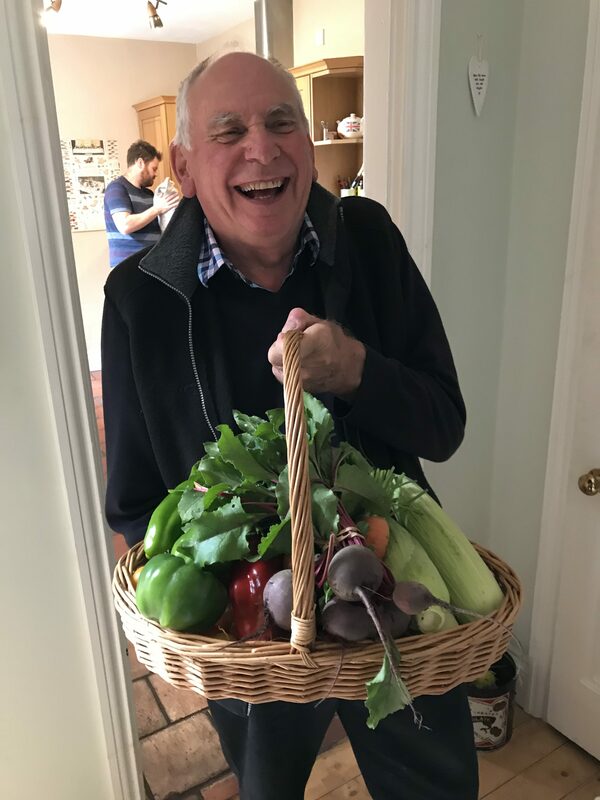 Gratefully receiving beetroots, tomatoes, peppers and aubergine from my folks. Cooking and eating: Red beans and ham hock, hidden-veg pasta sauce for Harry, Peach cinnamon buns, beetroot salad, mixed veg couscous. A 15% Manzanilla, the first time I’ve enjoyed a sherry since before pregnancy and sign that my liver is improving. Cough mixture. 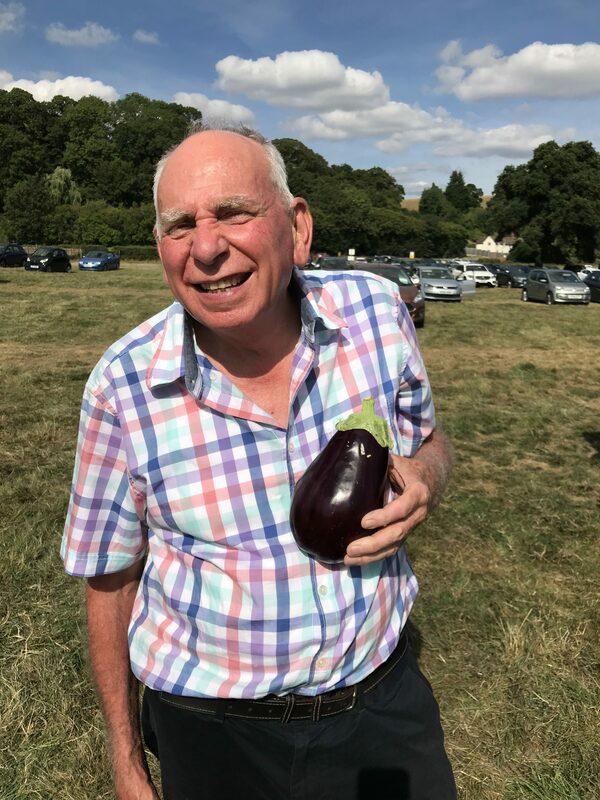 Visiting: Tenbury show. Lots of trips to Coventry for work. I start with a warning: when grinding steel to make a new top for the hopolisk, remember to wear goggles. 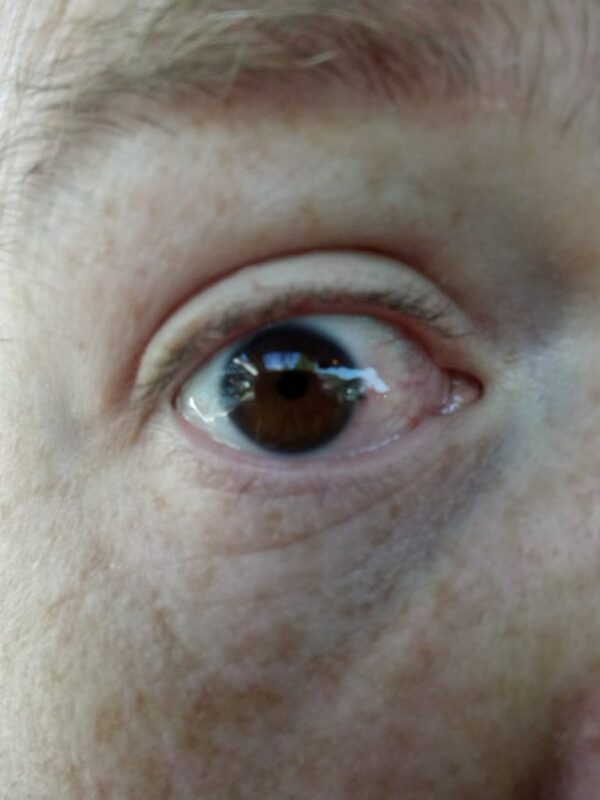 Matt failed to do so, got a fleck of steel in his eyeball, and had to go to the hospital for a jab from a doctor with a sharp implement. 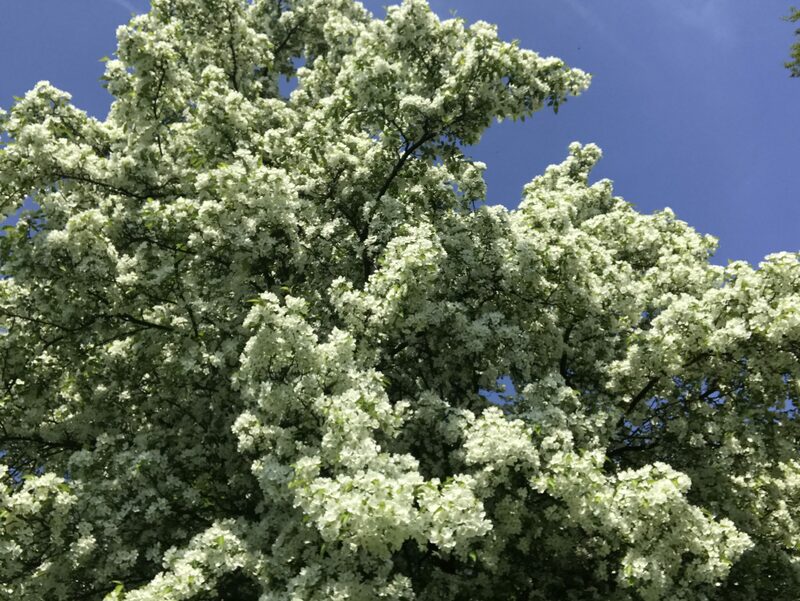 With both eyes now intact, we disappeared for a long weekend in the Peak District, which was happily imbued with Royal Wedding spirit, warm sun and abundant blossom. 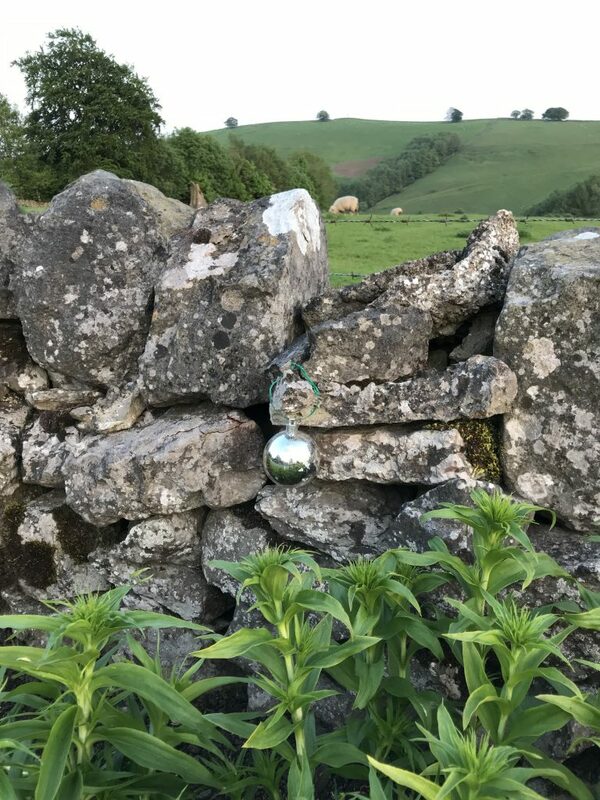 I had forgotten what it is to wake up to the sound of birds and sheep rather than buses – what a life affirming joy it is to be close to the land. Especially the land in May, the kindest of all months. Harry loved being away. 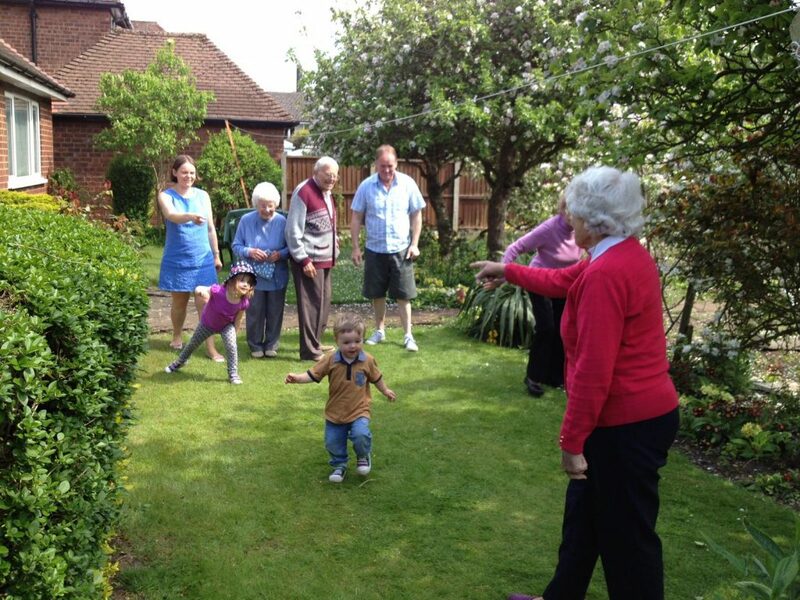 In the last two months he’s become incredibly skilled on his walker – it’s his passport to freedom. Turn your back for a second and whoooooooosh! He’s off! It turned out to be glorious of course. I went back the next night for another go. I have never forgotten that chocolate sorbet and everytime anyone goes to Sydney I tell them: find Messina! It’s AMAZING! 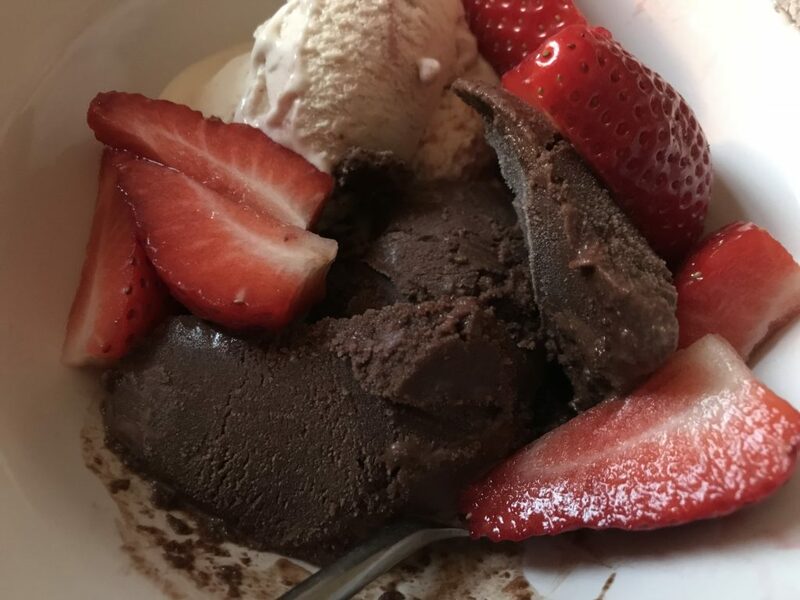 I’ve tried to recreate that chocolate sorbet a few times but never had any joy until I found this recipe, by Angel Adoree in the Vintage Tea Party Cookbook. Her trick is to use proper dark chocolate rather than cocoa, which makes for a smooth texture. I would add that it’s important to ensure that the syrup isn’t so hot as to make the chocolate seize when you mix them together. Use 70% chocolate and you’re all set. 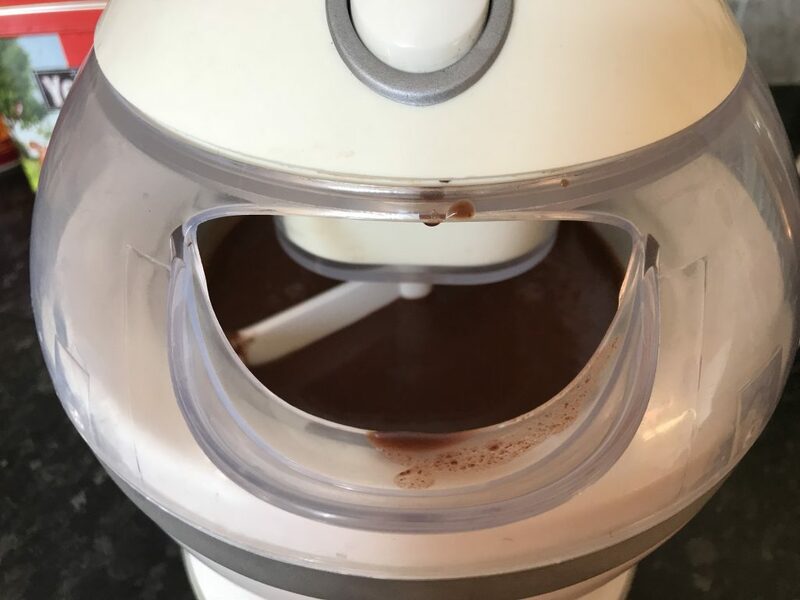 Ensure that your ice cream maker is properly frozen before you begin. 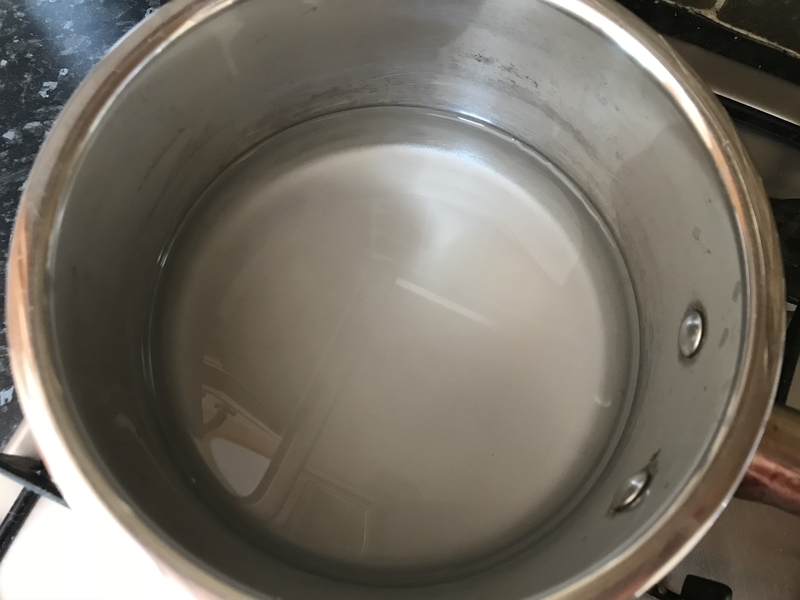 In a saucepan, melt 200g caster sugar into 500ml water until completely dissolved. Turn the heat off and leave to cool for 5-10 minutes. 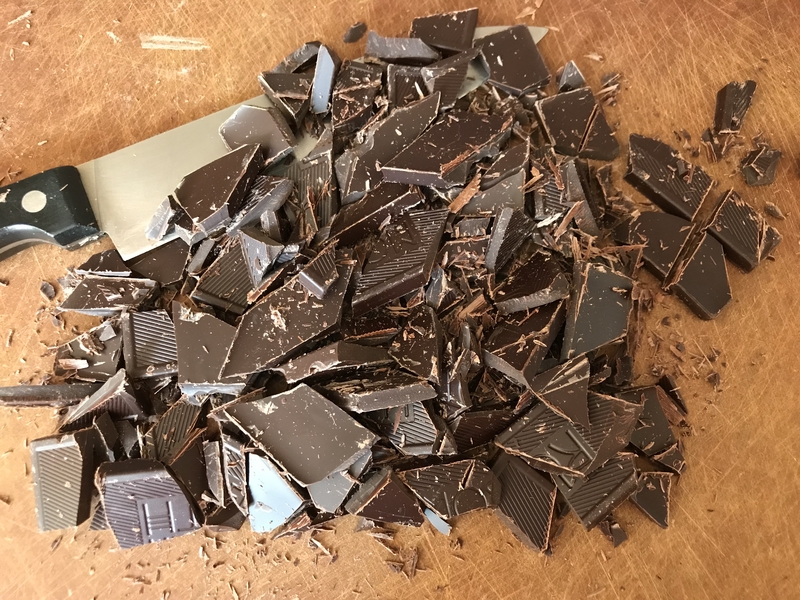 Meanwhile chop 200g dark chocolate into shards. I used 70% cocoa solids chocolate but it’s nothing posh, just Aldi own brand. Put the chocolate into a heat-proof jug, pour the syrup on top, then stir until the chocolate has melted. Don’t pour boiling syrup onto your chocolate else the chocolate will seize. Put the jug into the fridge and chill thoroughly (about 2 hours). When the syrup is properly cold, churn to a slushy sorbet in the ice cream maker, then freeze until firm. When you want to serve, take the sorbet out of the freezer for at least 10 minutes to soften slightly. This is really really intensely chocolatey but it doesn’t have the lingering cloyingness of chocolate ice cream. 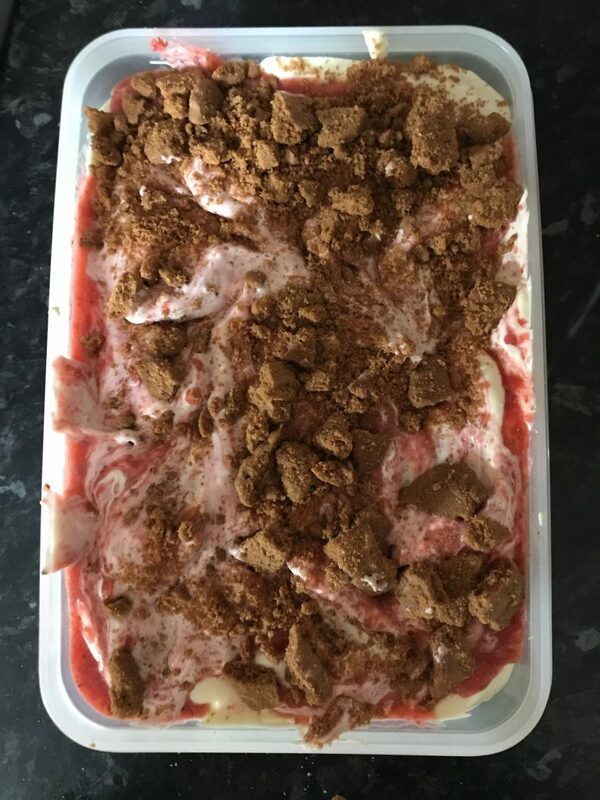 I like it with sliced strawberries and a suggestion of cream. Allotment: Planted out sweet peas, courgette, squash, zinnia, rudbeckia, borage, chrysanthemums. Tomatoes went into the greenhouse (hard work – it was 40c heat in there). 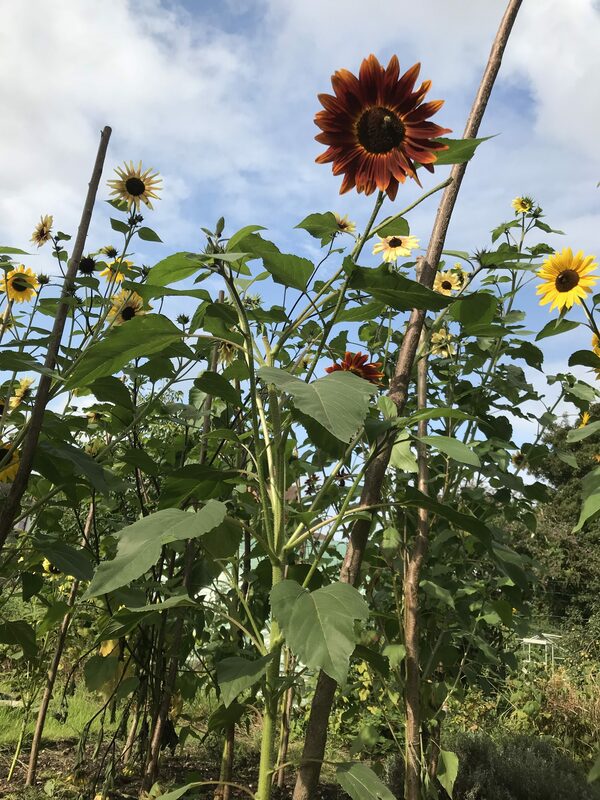 Finally dug over the sunflower patch. 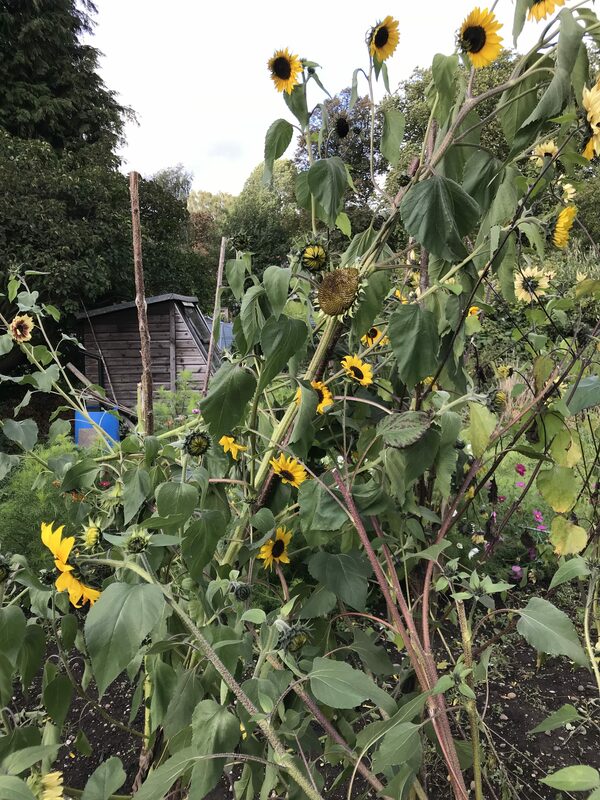 Went on a trip to Worcester to buy new hazel poles for the sunflowers from Worcester Coppice Crafts. 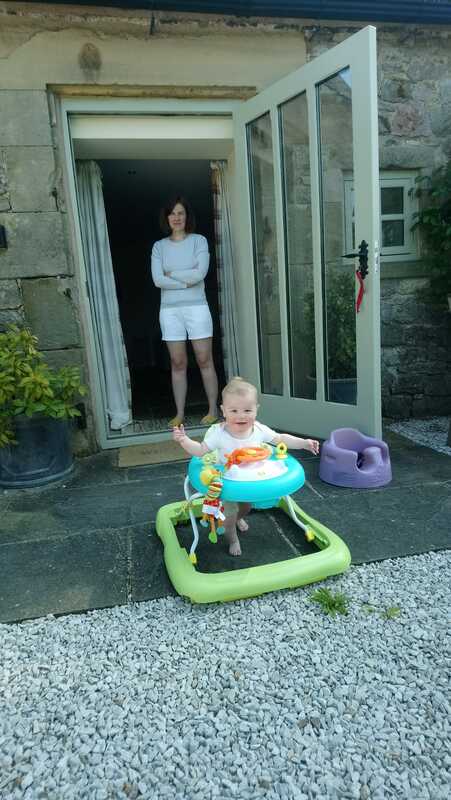 With the warm weather, long days, a happy baby and the last few weeks of maternity leave, I’m finding I can get loads done….it’s like a shot of energy and enthusiasm. Eating & Cooking: Cream tea at Chatsworth Farm Shop, chips at one of the numerous chippies at Matlock Bath. Make a lovely lentil salad rich with mustard and garlic, tossed with sausages and rocket from the garden.